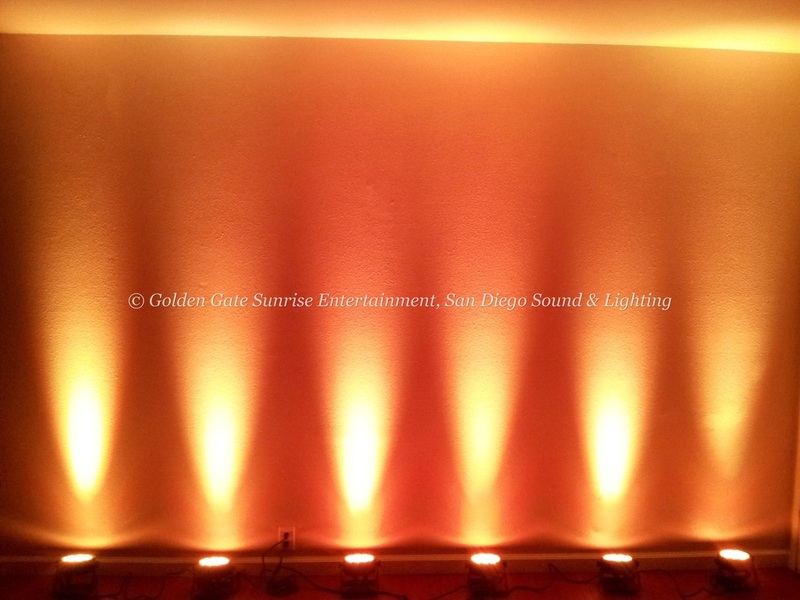 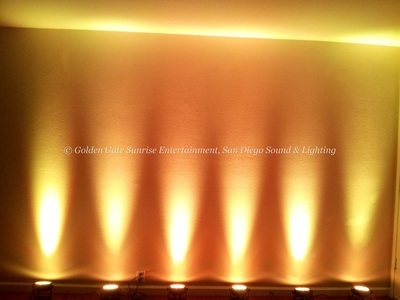 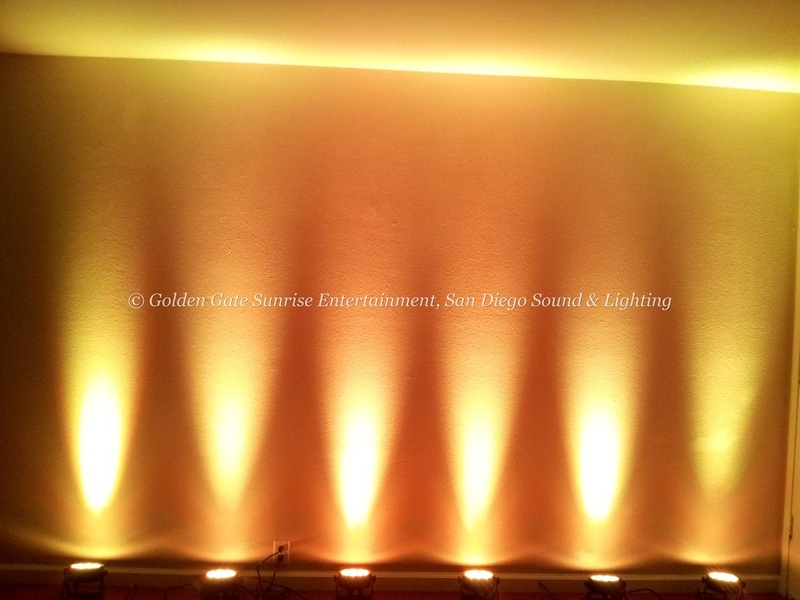 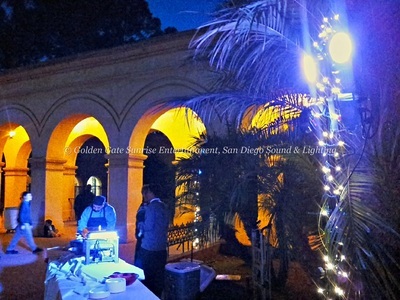 Event Location: Hilton La Jolla Torrey Pines, Scripps Ballroom. 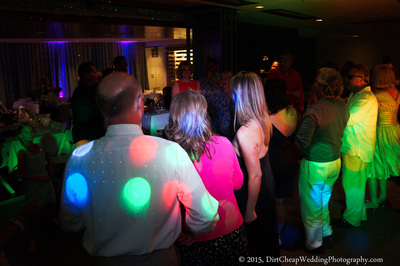 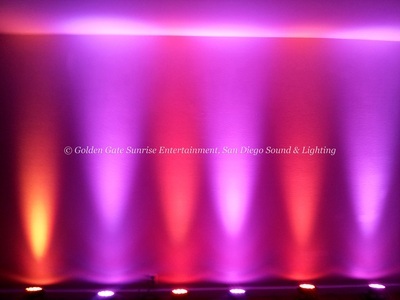 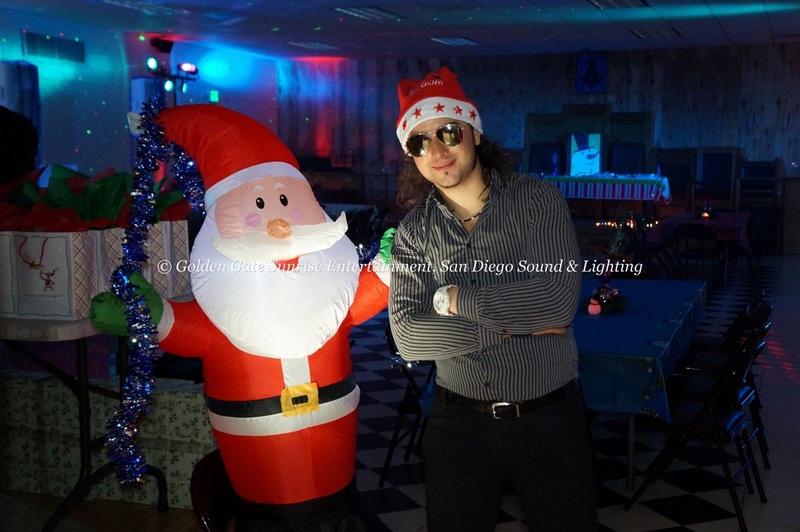 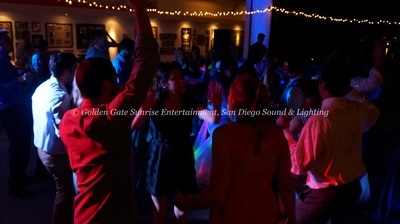 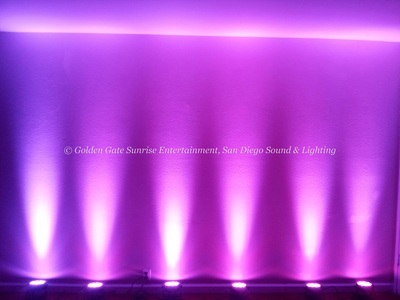 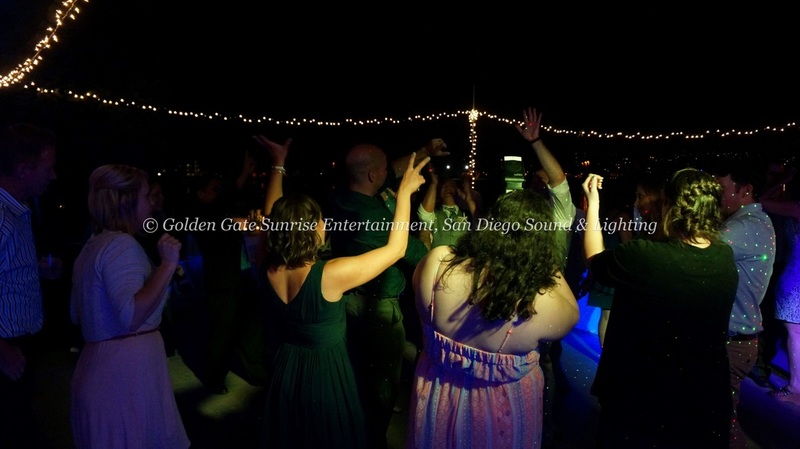 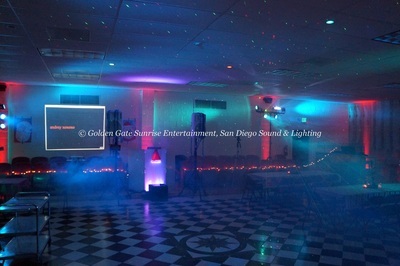 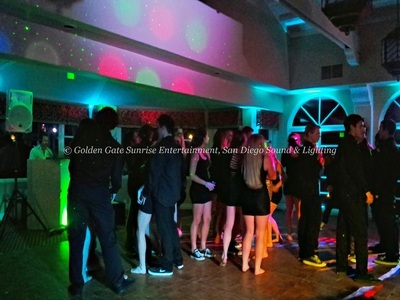 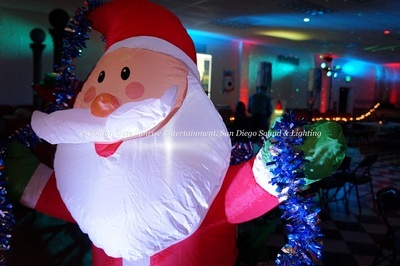 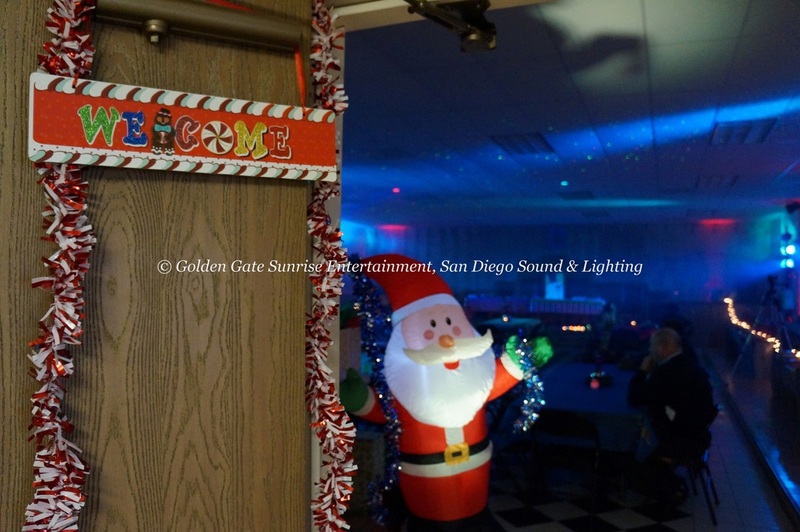 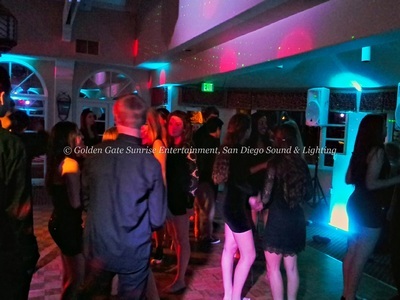 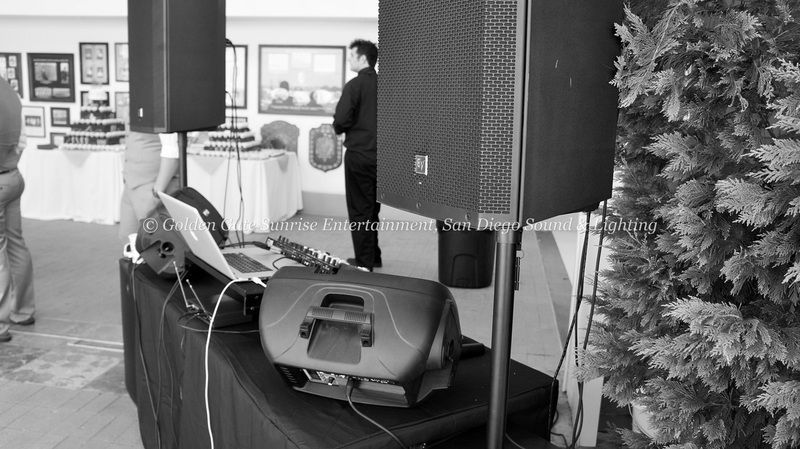 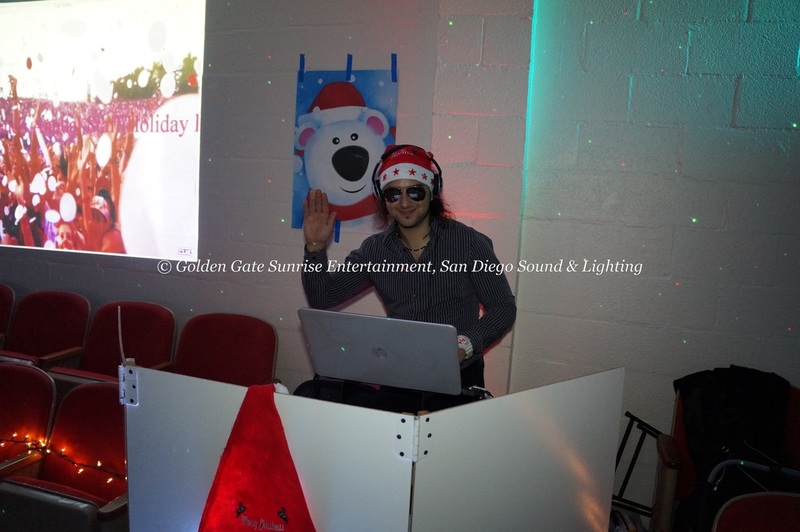 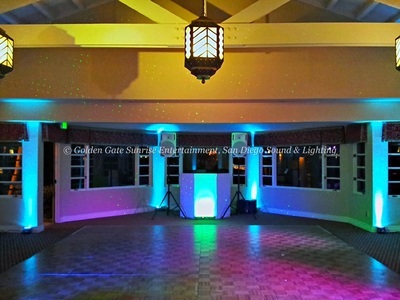 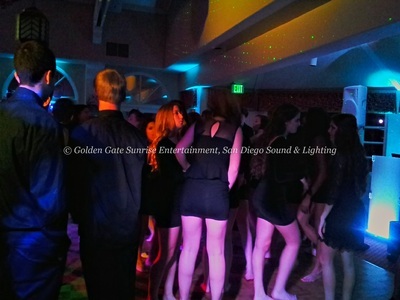 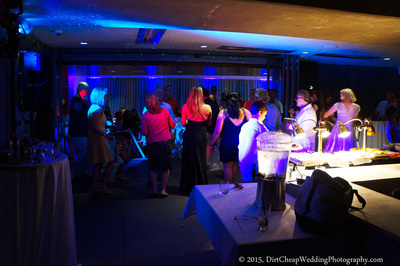 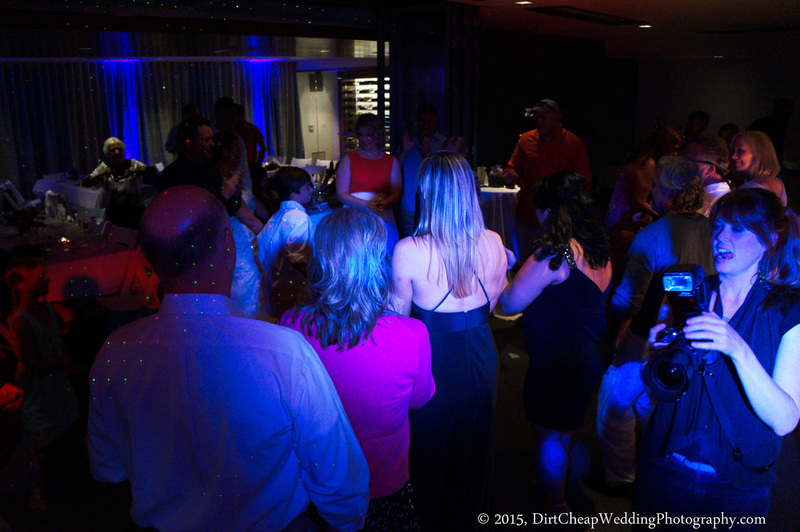 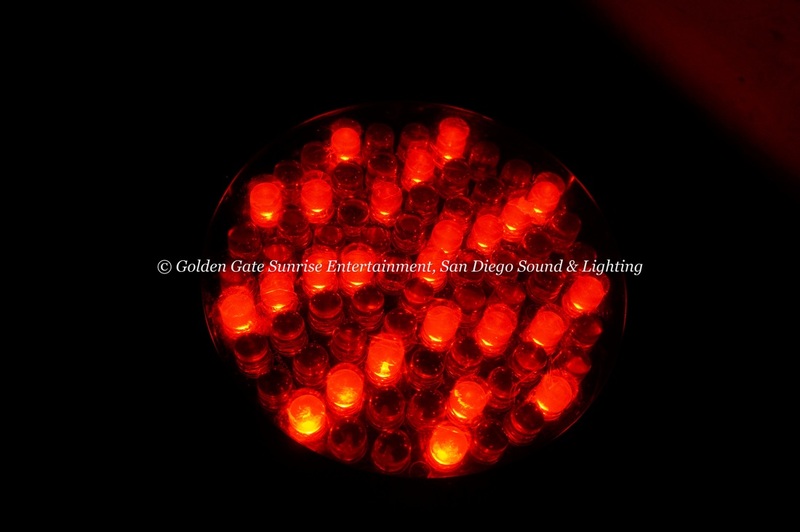 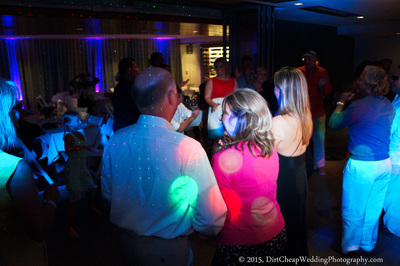 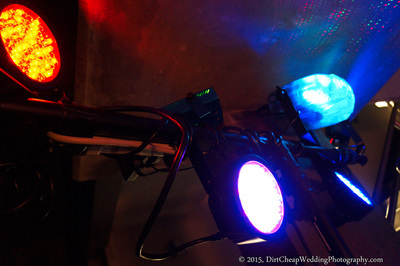 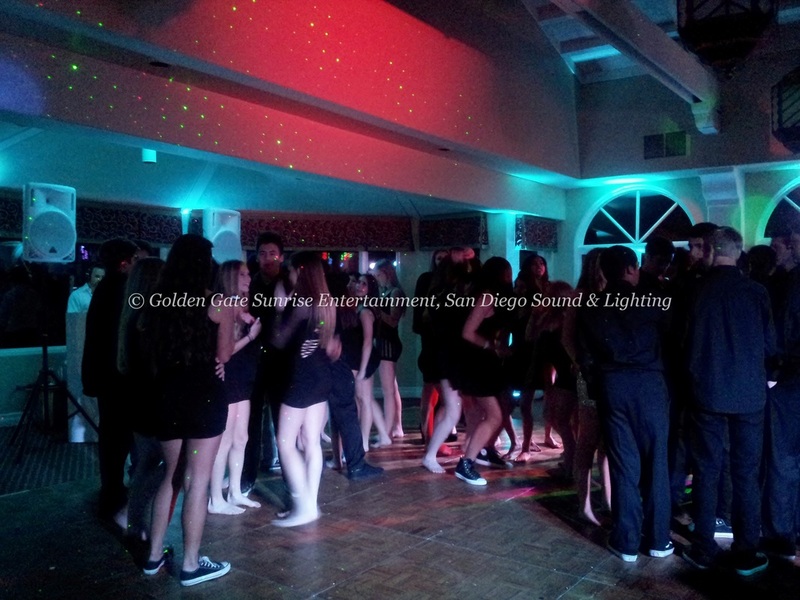 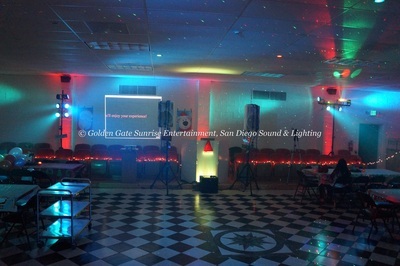 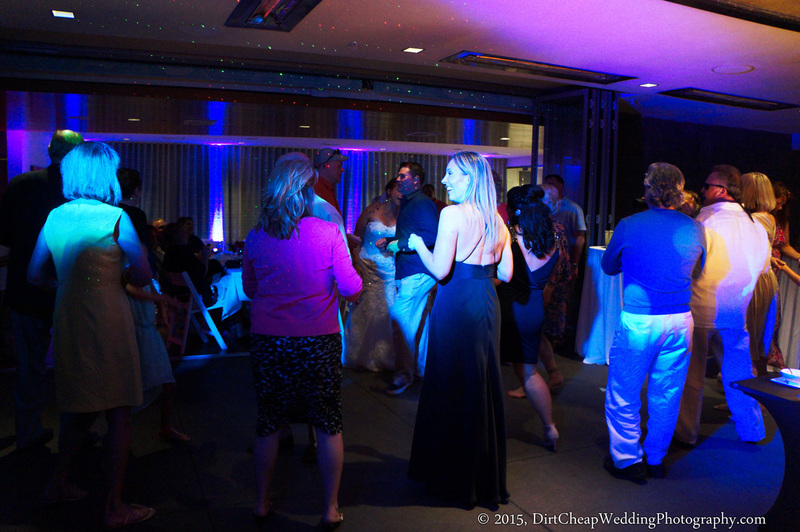 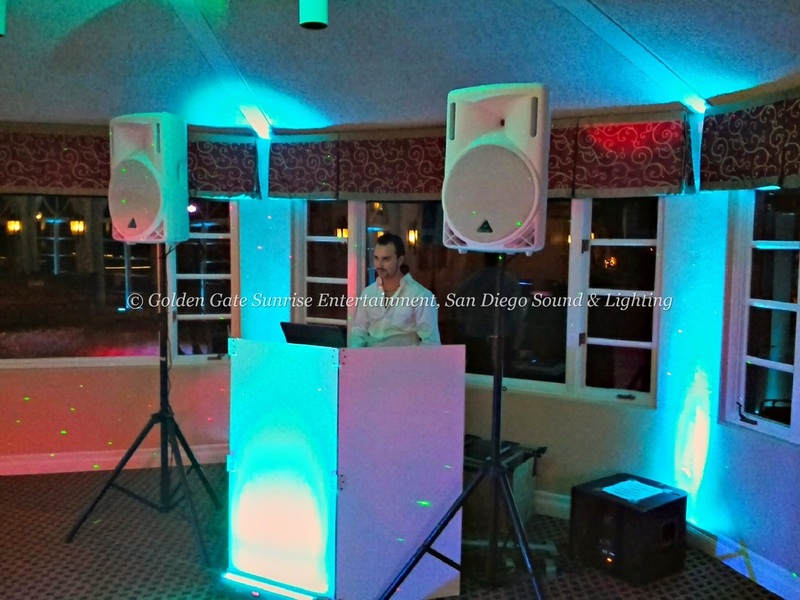 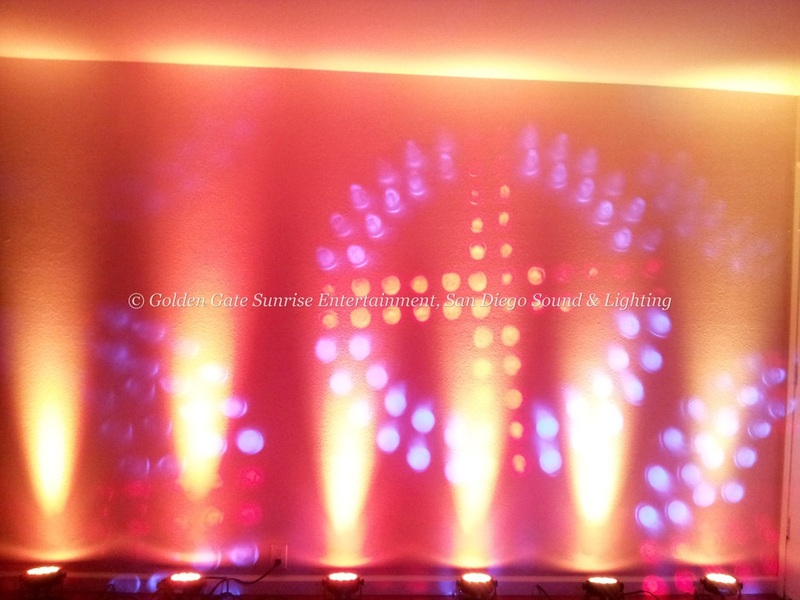 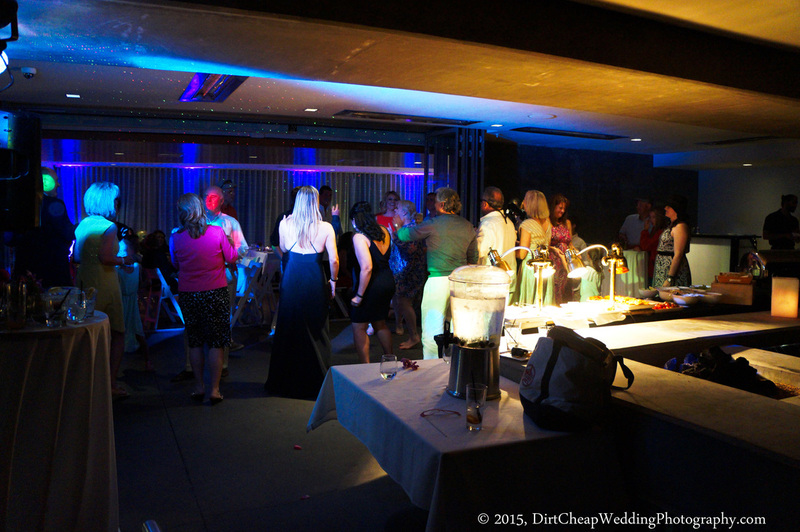 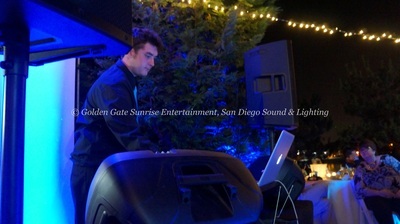 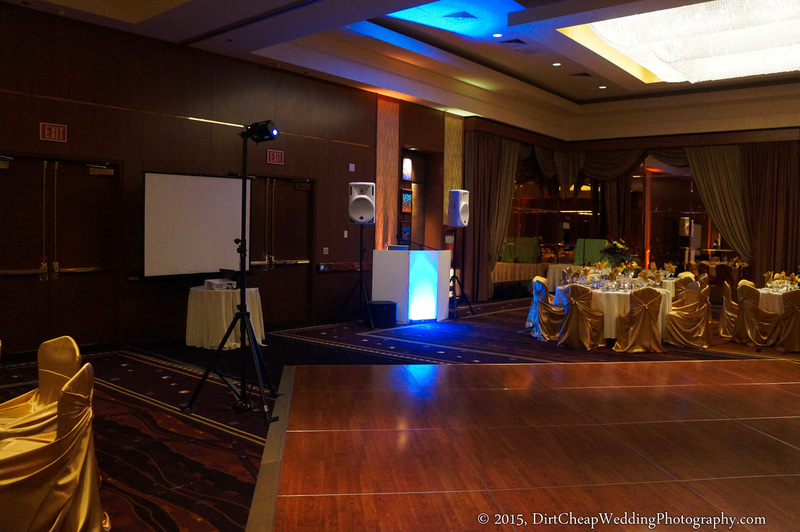 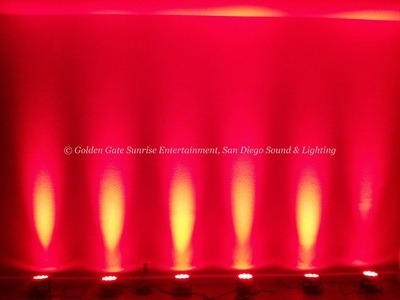 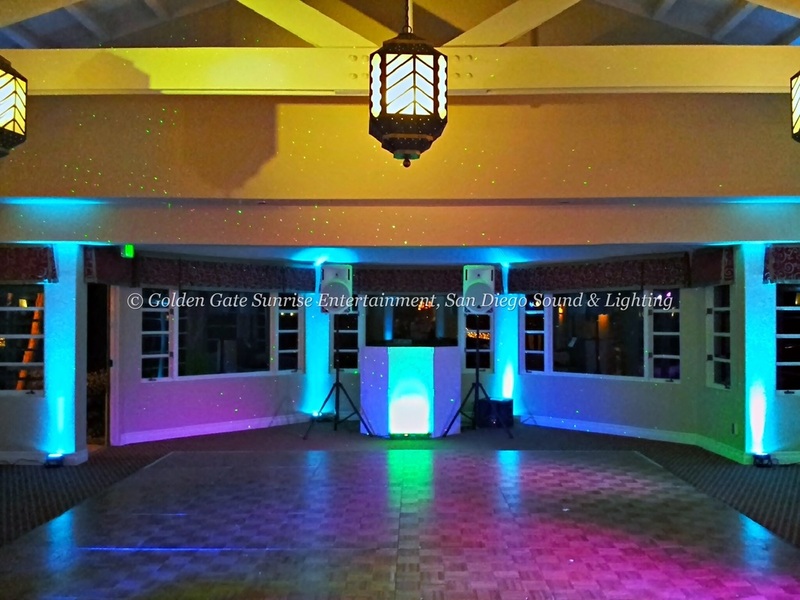 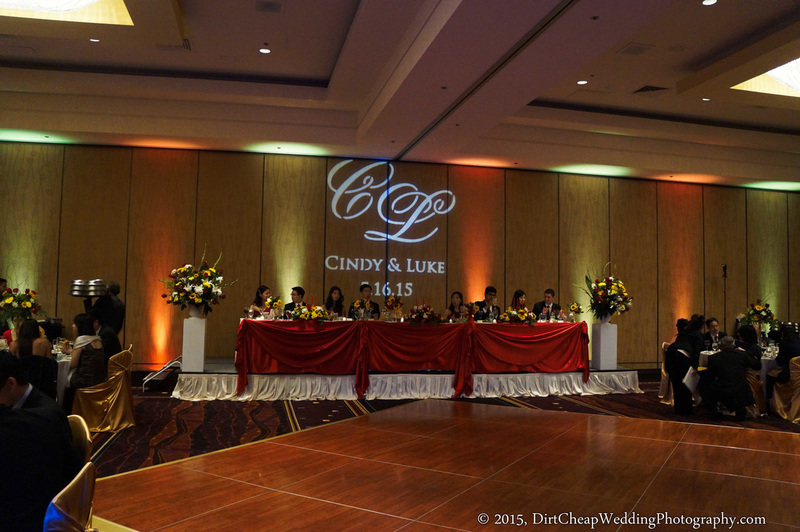 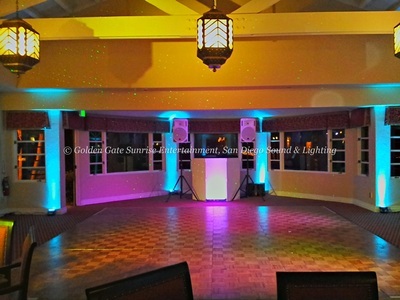 Lighting Type: Dance Floor Lighting (DJ Lights), LED Up Lighting and Gobo Lighting. 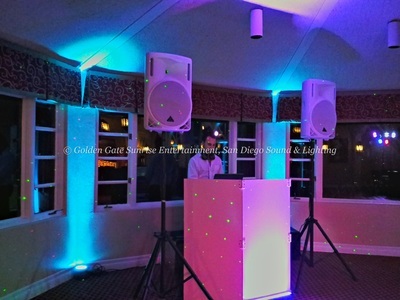 Fixtures Used: Chauvet Slim Par 38 LED, Chauvet Gobo Zoom LED 2.0, American DJ Jellyfish LED and ADJ Glaxian Laser. 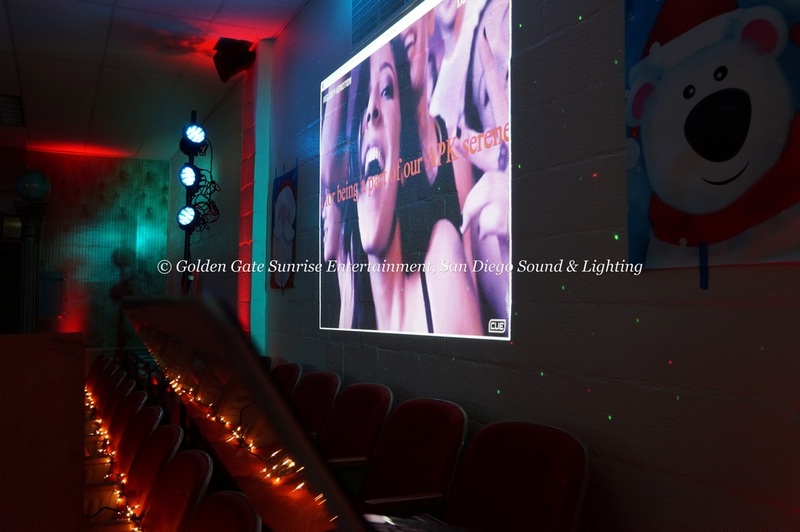 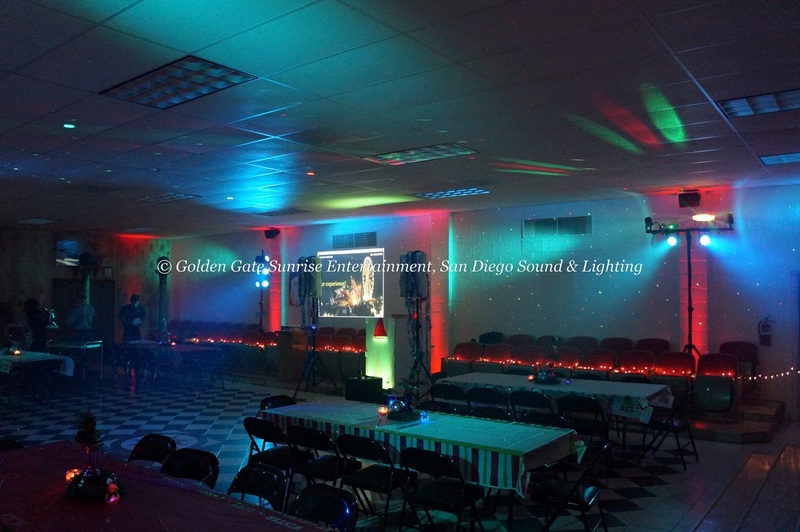 Number of Fixtures in the Room: 19 (12 LED up lights + 6 dance floor lights + 1 gobo projector). Event Location: Scripps Seaside Forum, La Jolla, CA. 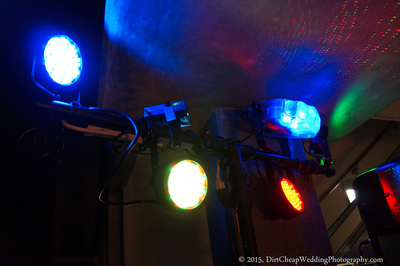 Lighting Type: LED Up Lighting. 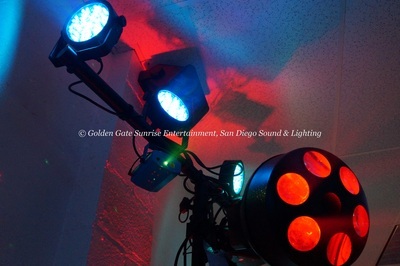 Fixtures Used: Chauvet Slim Par 38 LED. 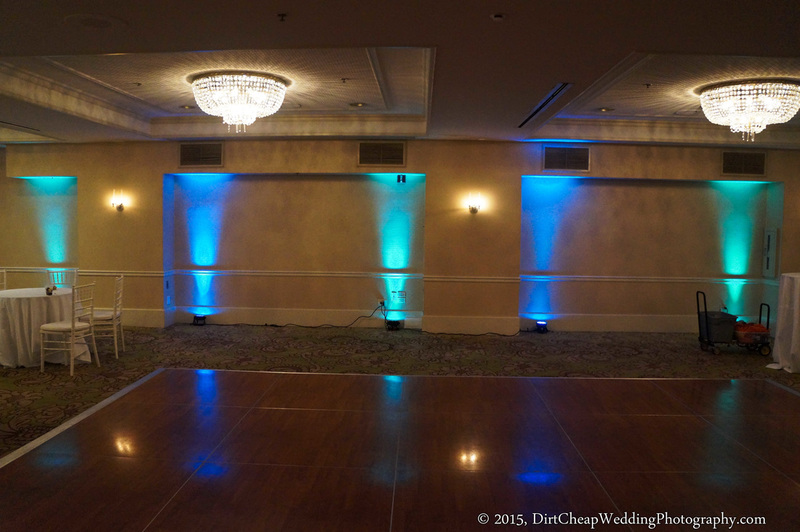 Number of Fixtures in the Room: 5. 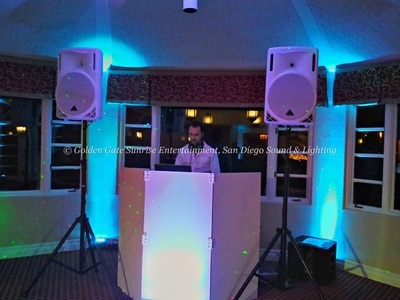 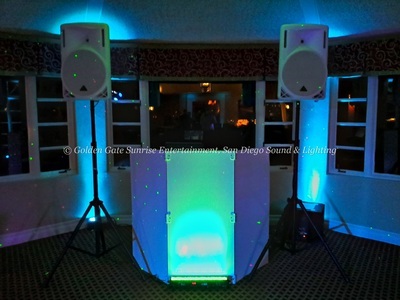 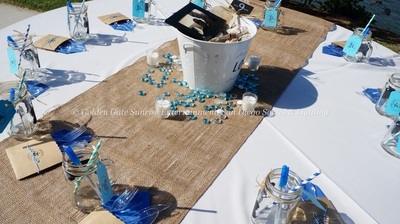 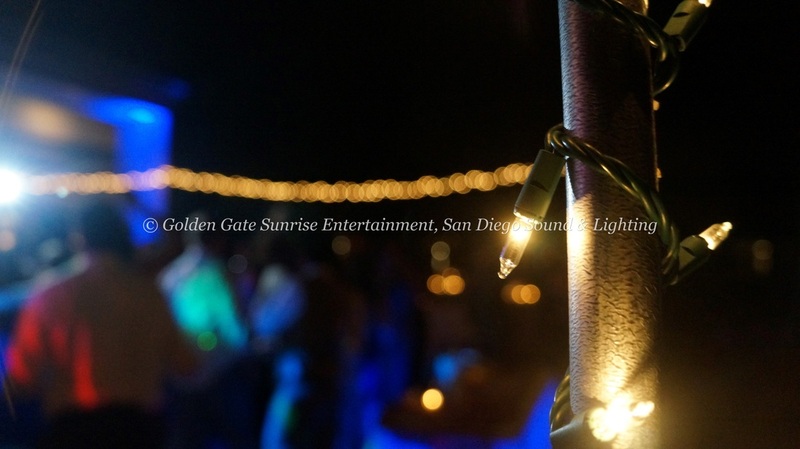 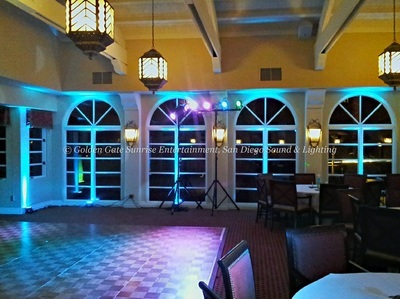 Event Location: L'auberge Del Mar Hotel, Del Mar, CA. 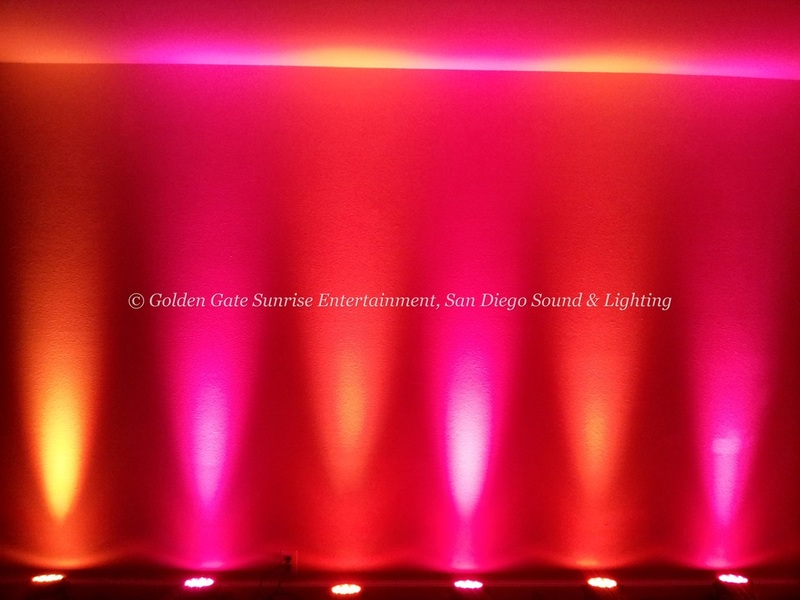 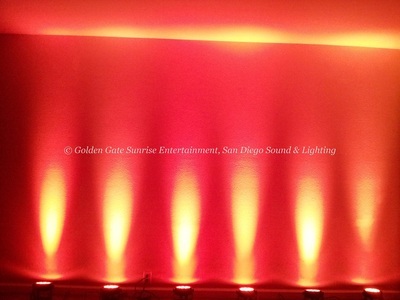 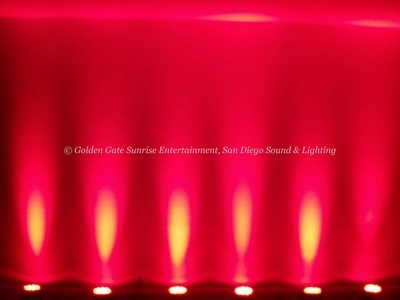 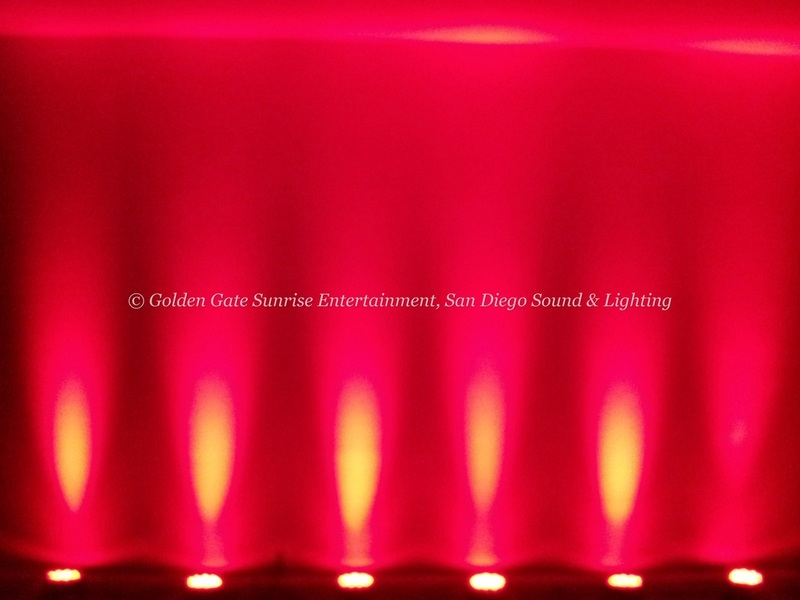 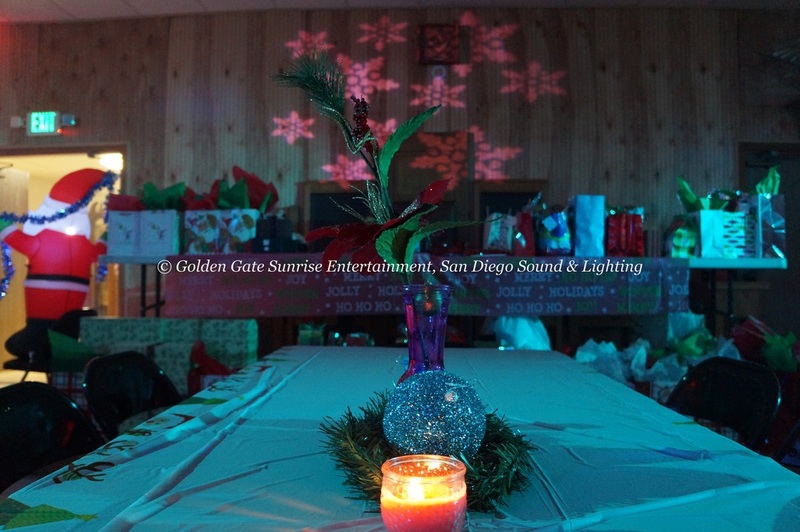 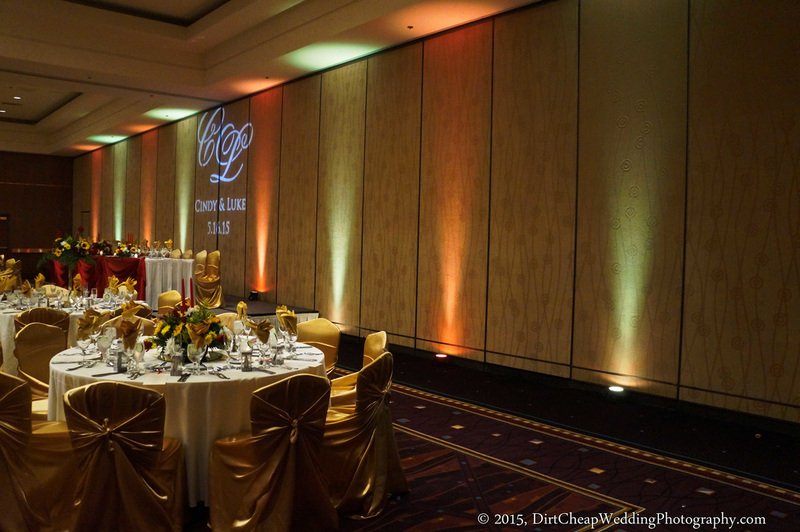 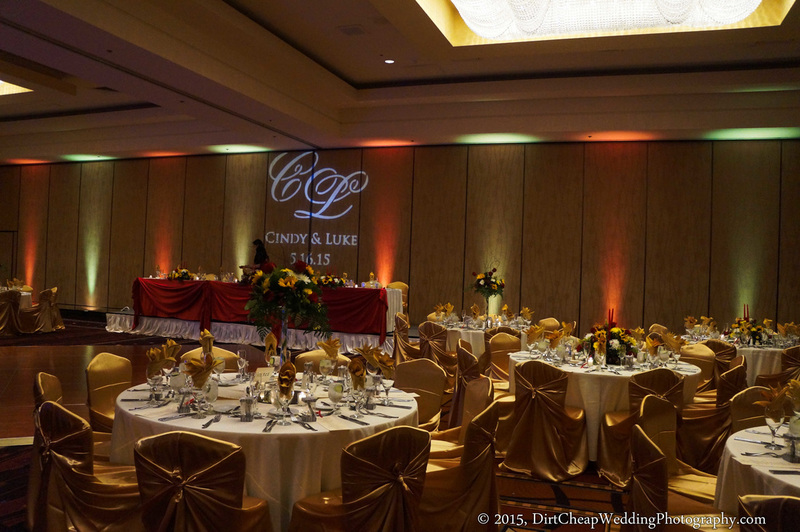 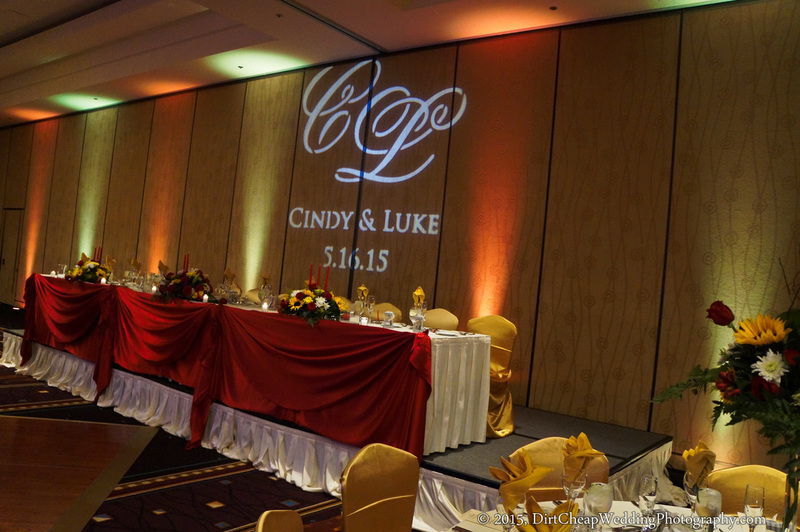 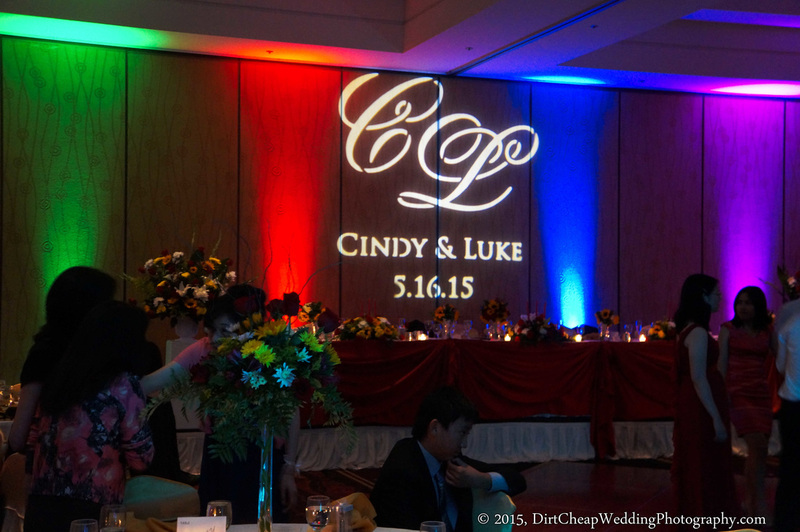 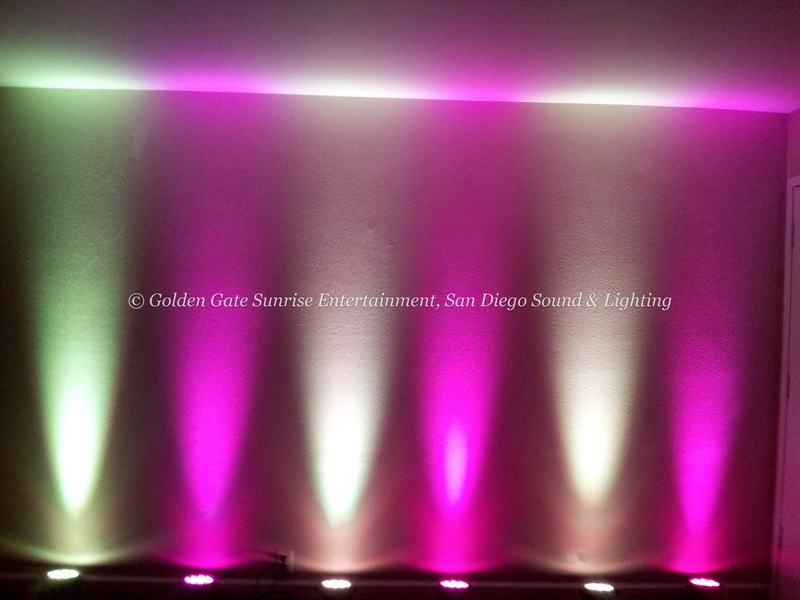 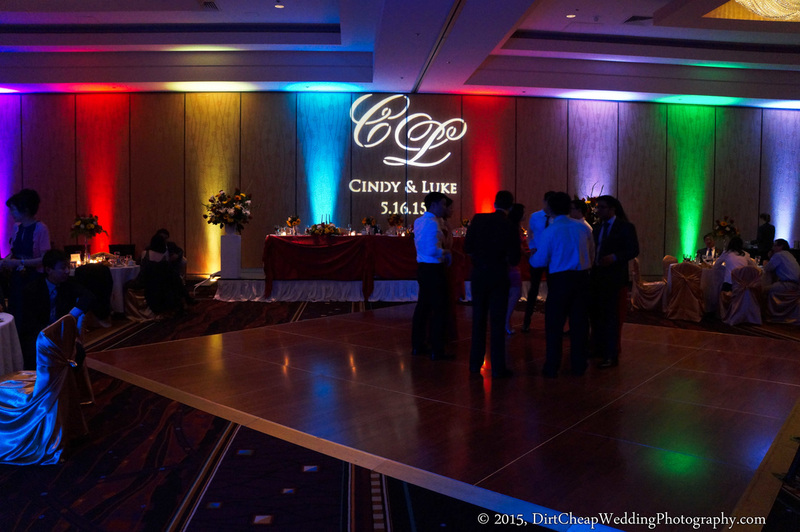 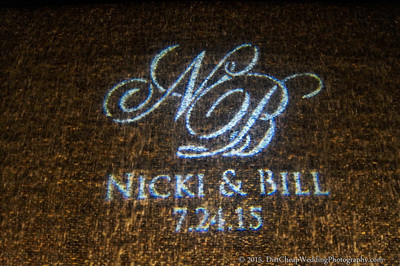 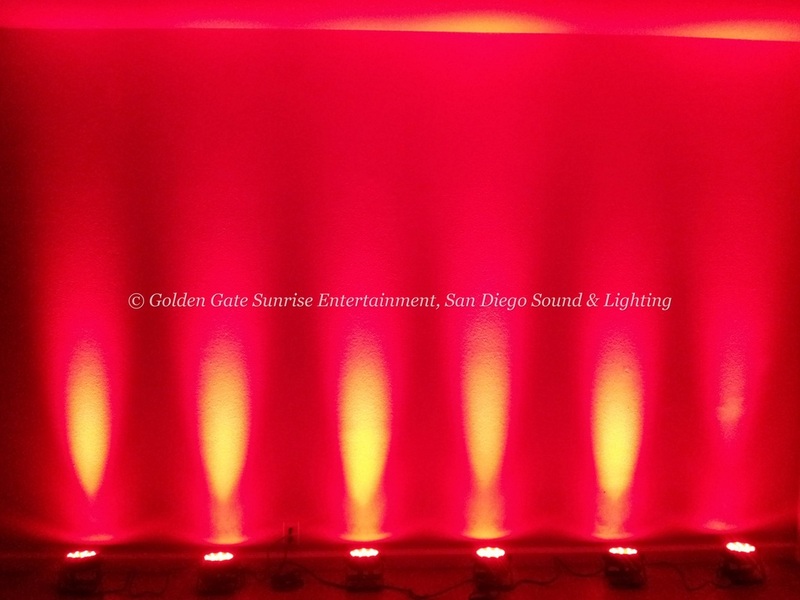 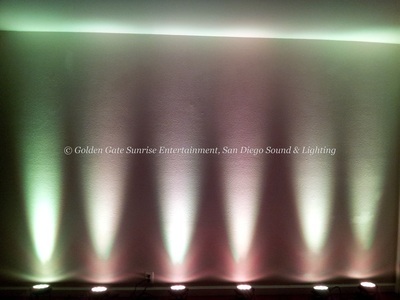 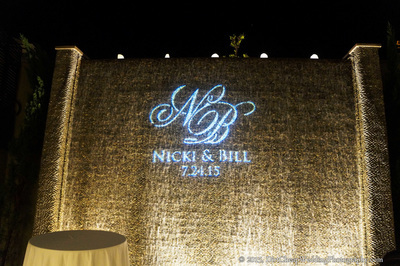 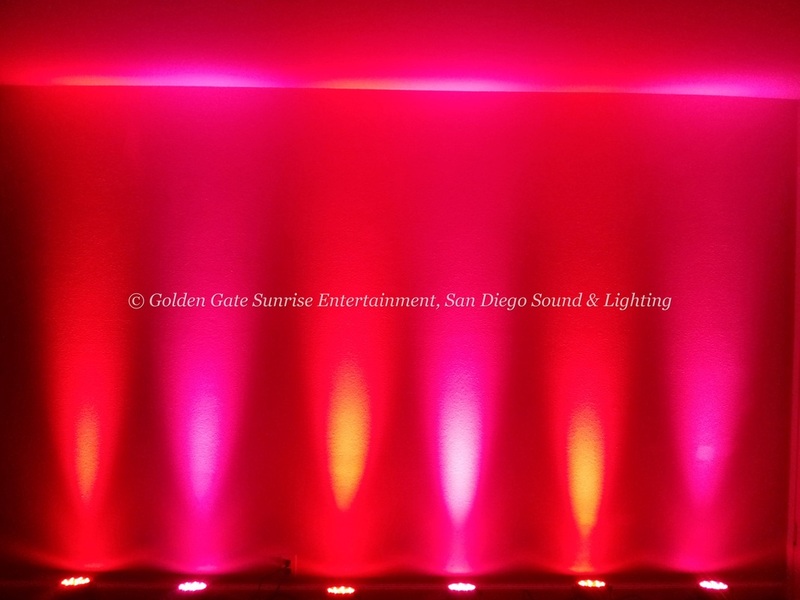 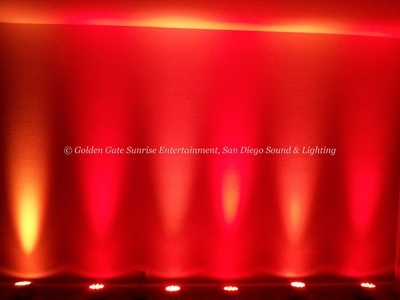 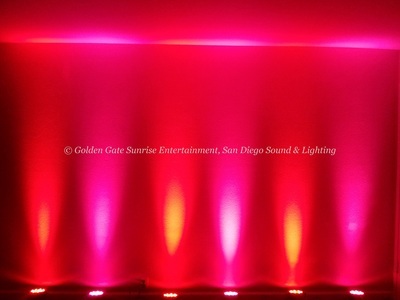 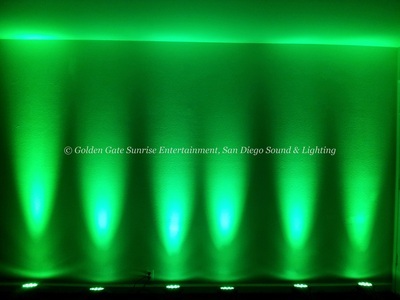 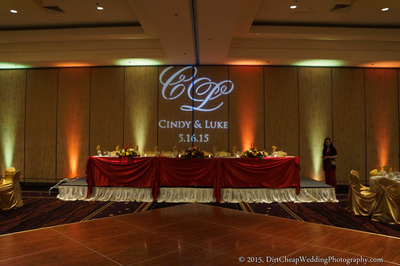 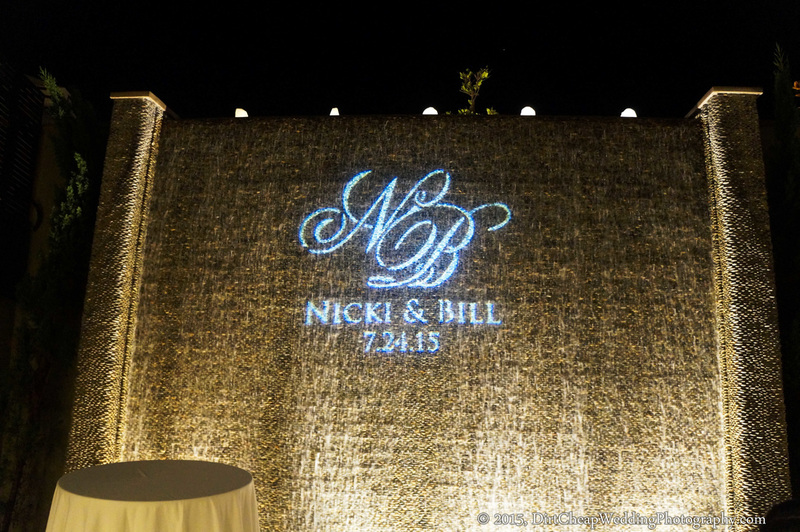 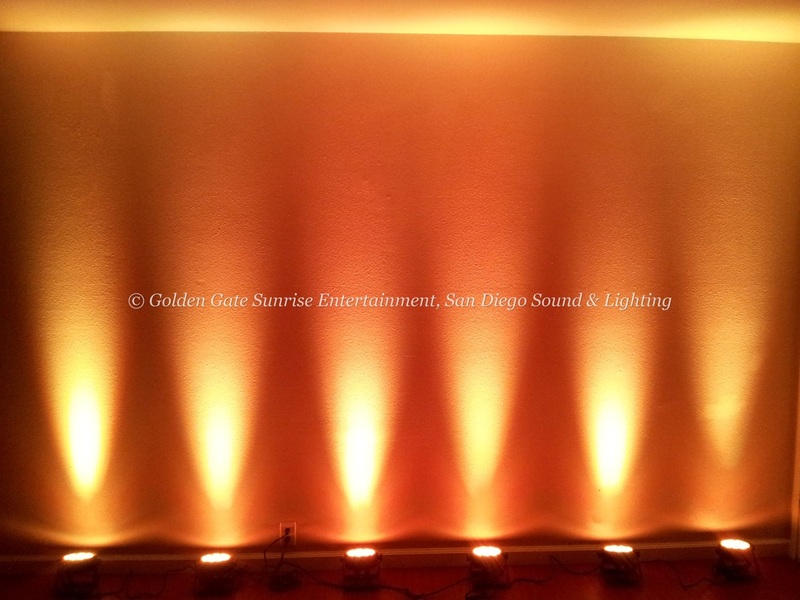 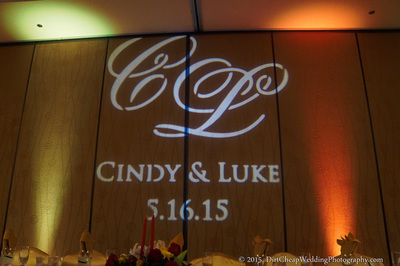 Lighting Type: Custom Gobo Monogram and LED Up Lights. 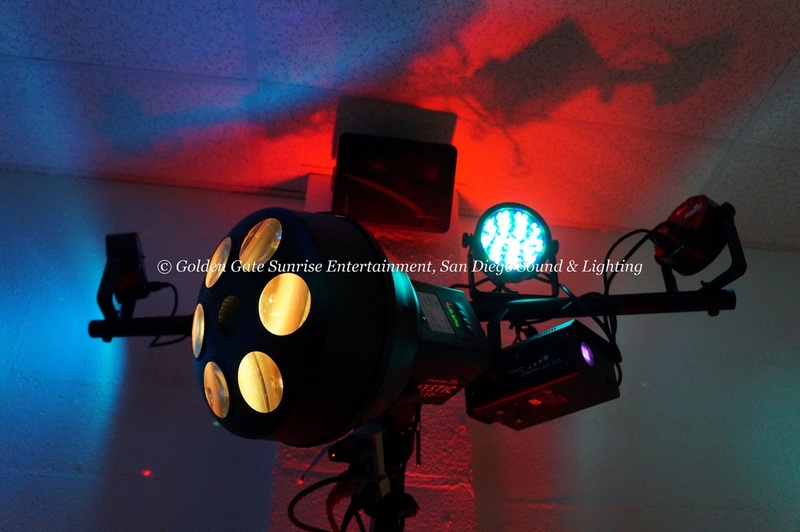 Fixtures Used: Chauvet Slim Par 38 LED and Chauvet Gobo Zoom LED 2.0. 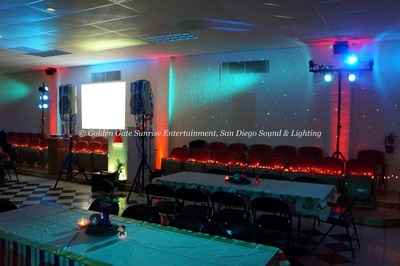 Number of Fixtures in the Room: 13 (12 LED lights and 1 gobo projector). Number of Fixtures in the Room: 10 (4 up lights + 6 dance floor lights). 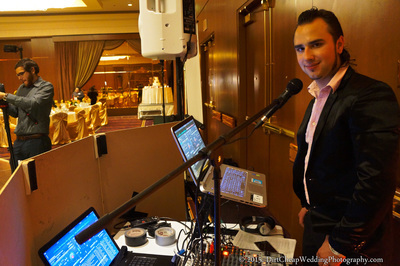 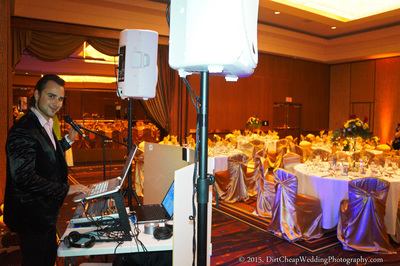 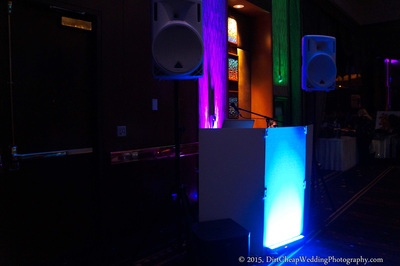 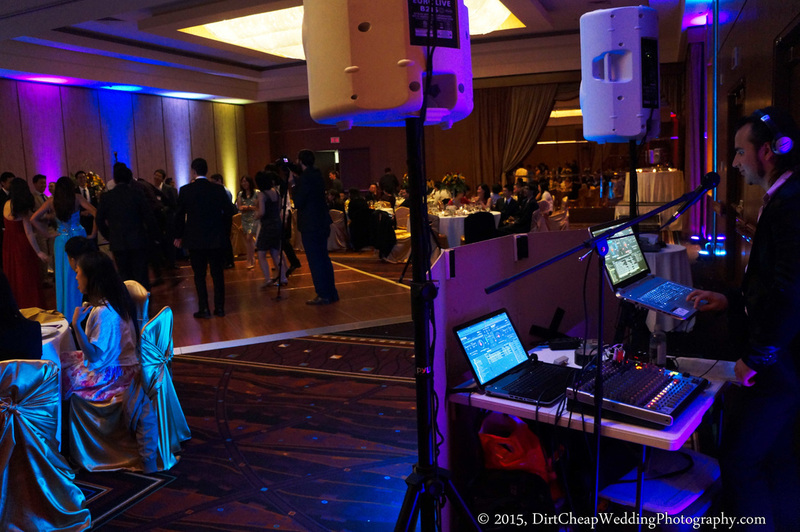 So, you're booking a DJ or a PA rental service for your wedding. You've sifted through dozens of DJs, dozens of rental packages, all offering dozens of choices for sound, lights, microphones, and musical offerings. 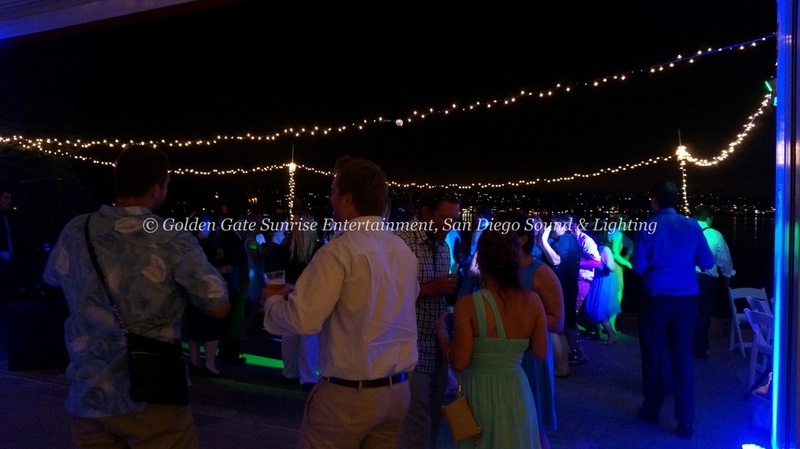 You think you've got it worked out, and you're almost ready to book someone. 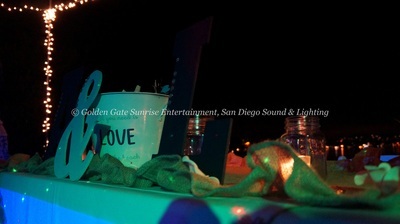 But one thing sticks out to you. 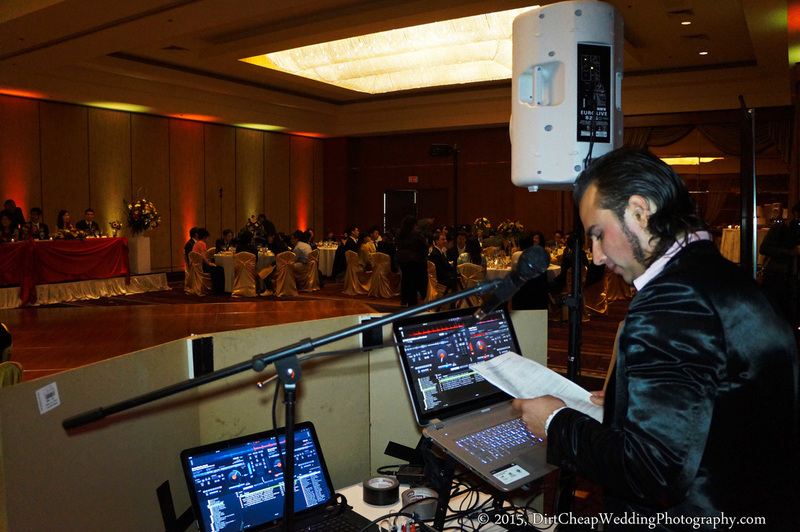 Why do some DJs advocate for using wireless microphones over wired microphones, and vice versa? Why should you care?The answer is simple: Consistency. Yes, wireless microphones offer more freedom and mobility during toasts and announcements, and if they are sufficiently powerful, can allow you to make speeches from anywhere on the event grounds. 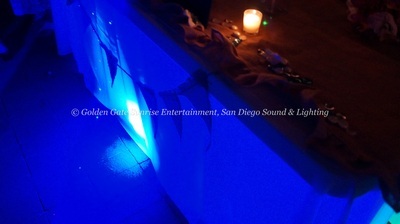 But they come with some significant risks. 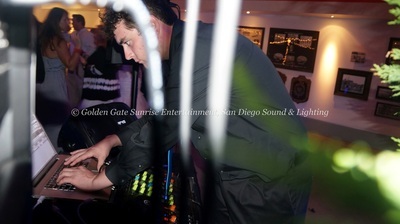 Namely, interference. 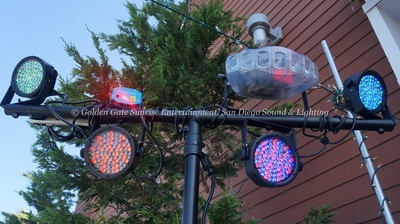 Here in Southern California, we live close to several military bases, all employing state of the art high-powered communications equipment and radar. All those electronics emit radio waves powerful enough to cause static and other interference to all small radio devices in an area. 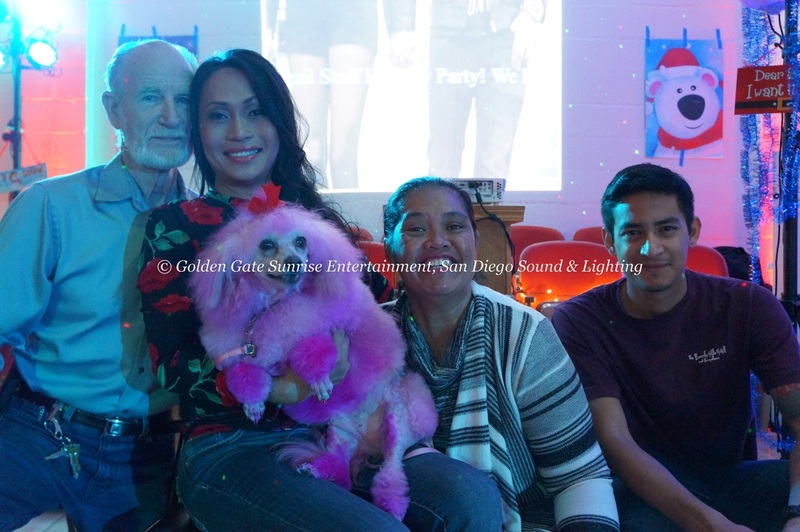 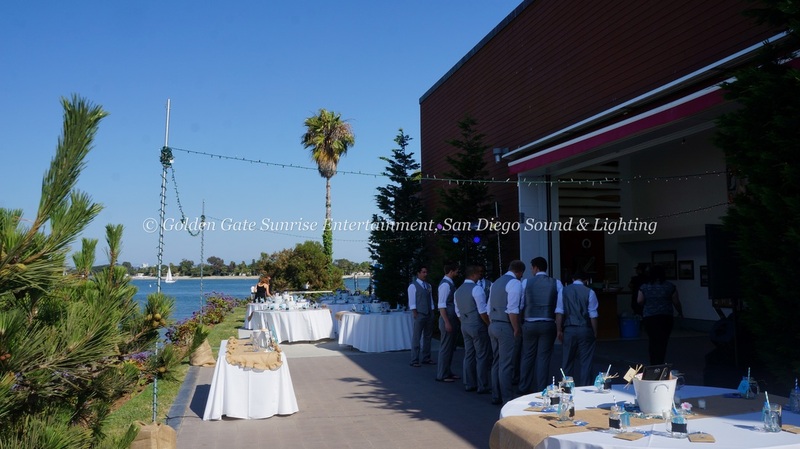 So if you have your wedding near San Diego, and opt for wireless microphones, there is a very real chance your vows may get swallowed up in white noise and distortion. 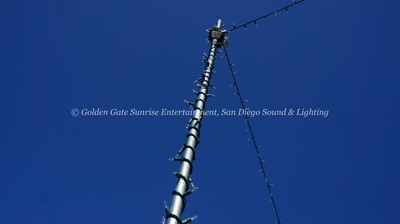 Wired microphones however, carry no such risk. 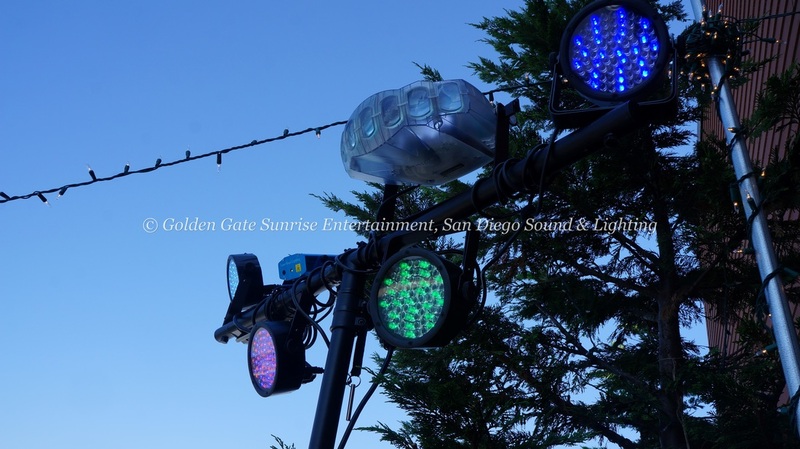 Their cables are shielded against radio frequency interference, and because they are directly connected to the speakers, there's never any need to fumble for switches to try and change bands to salvage the sound. Wired mics work perfectly right out of the box, and they don't run the risk of technical malfunction. 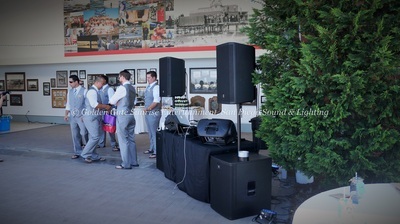 They are, in short, consistent and reliable. 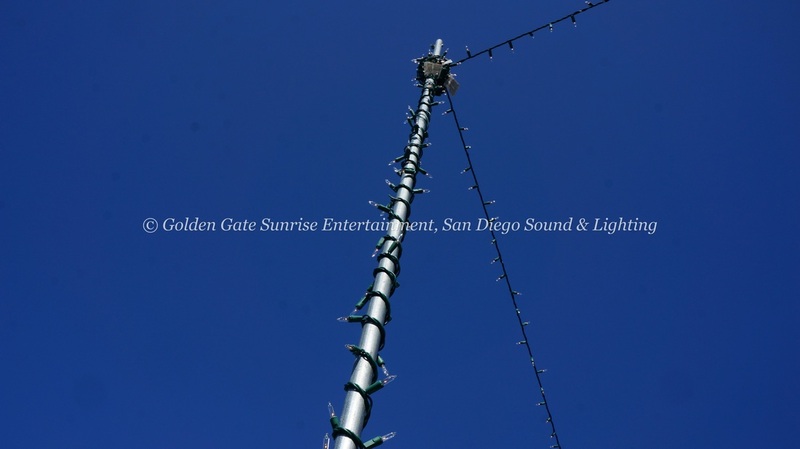 Their biggest drawback, is being limited to the length of the cable they're attached to. 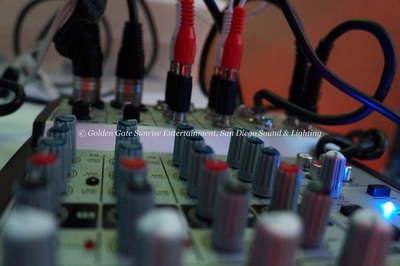 Both types of microphones have their strengths and weaknesses. Knowing this, you can decide for yourself what will best suit you. 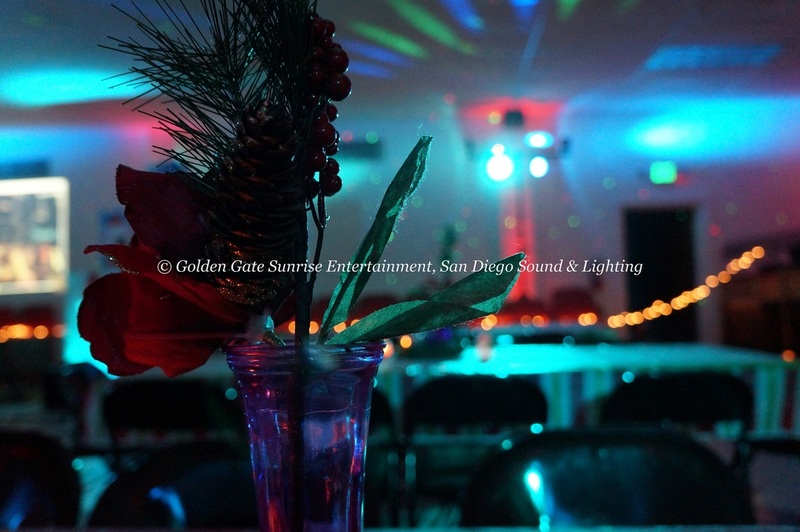 Event Type: Corporate Holiday Party. 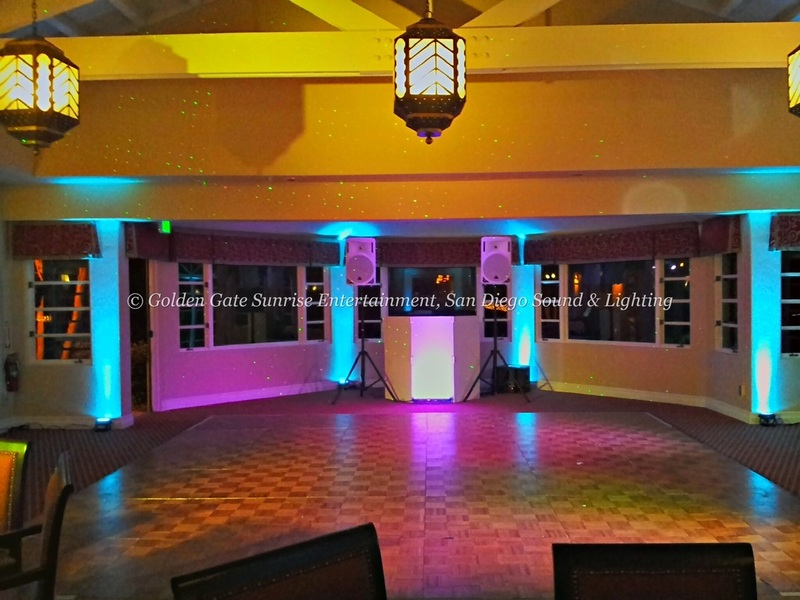 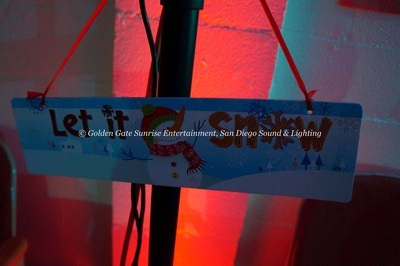 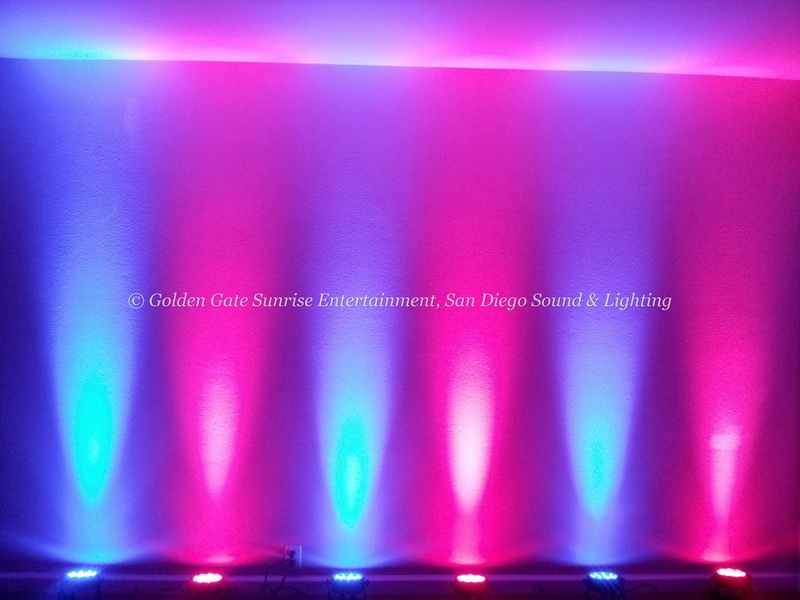 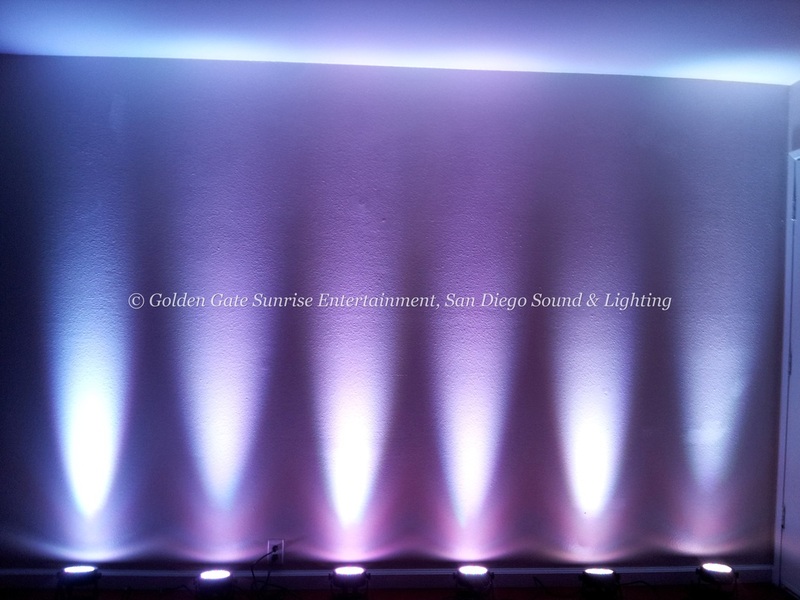 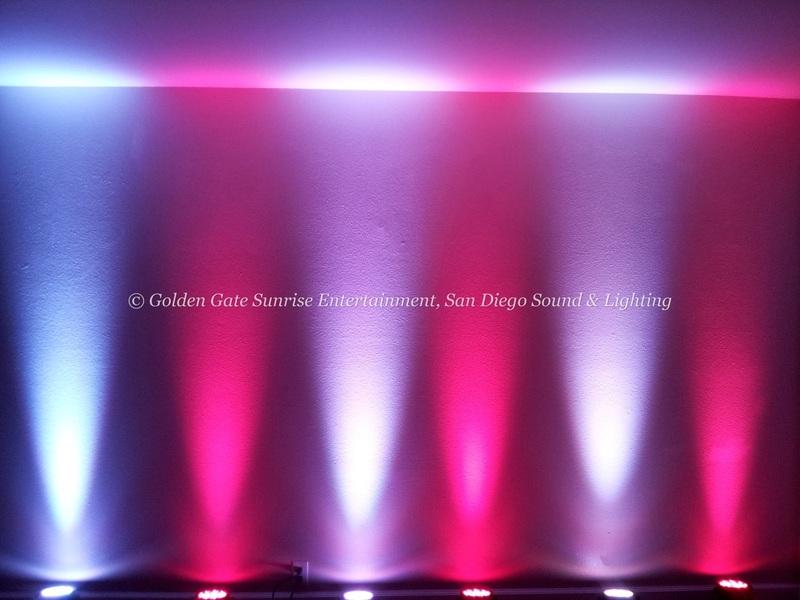 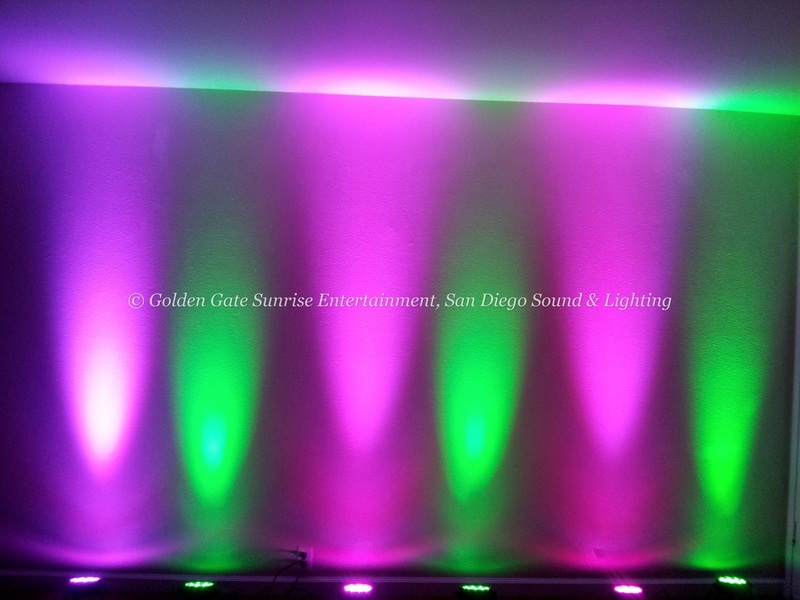 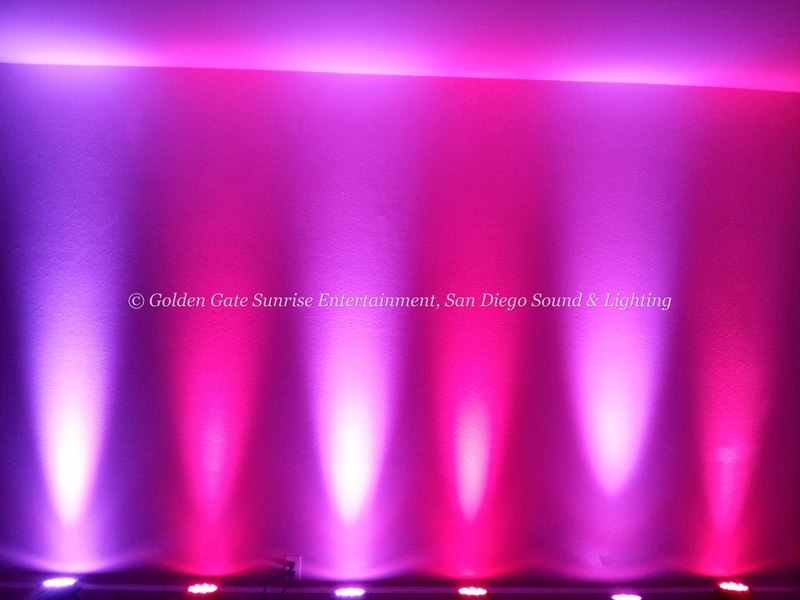 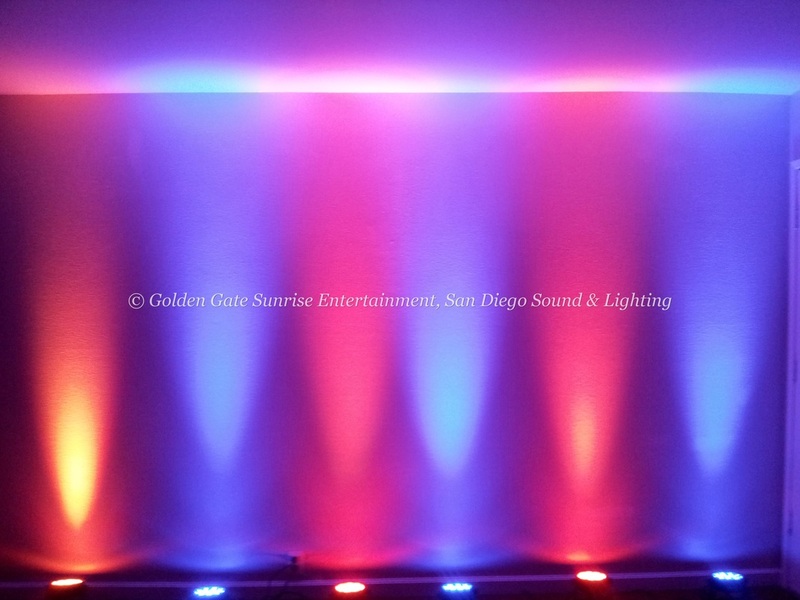 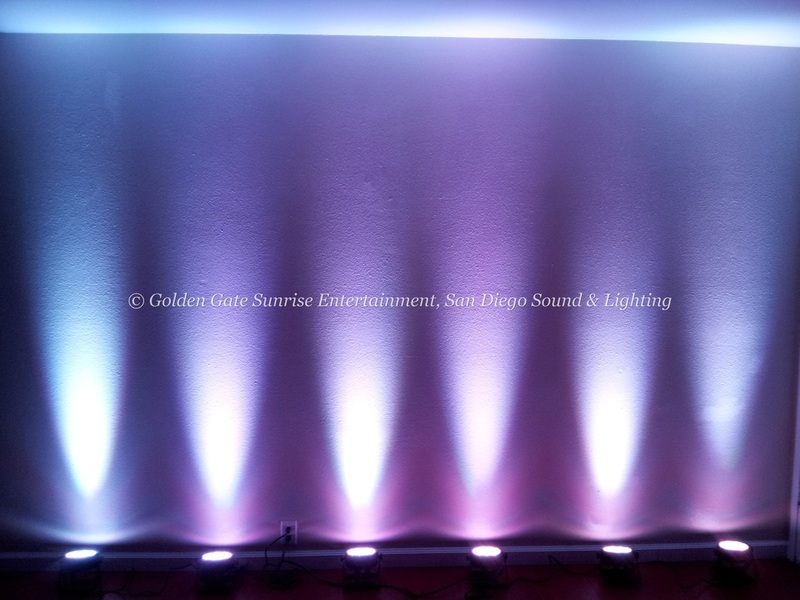 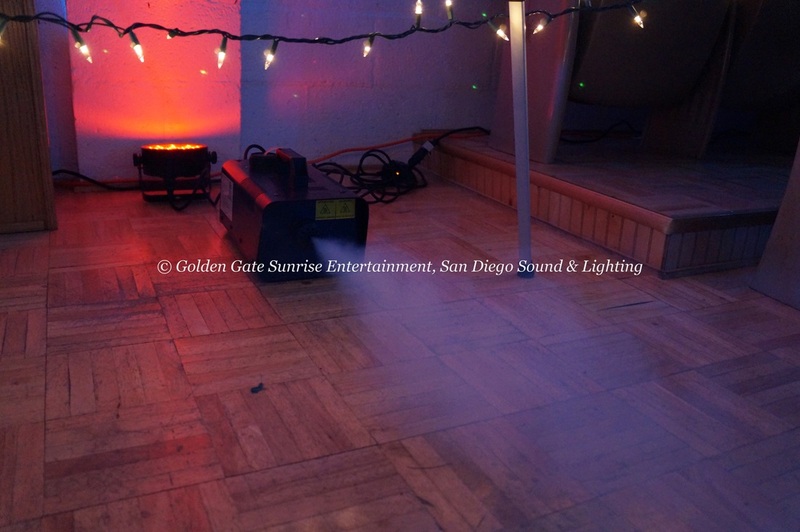 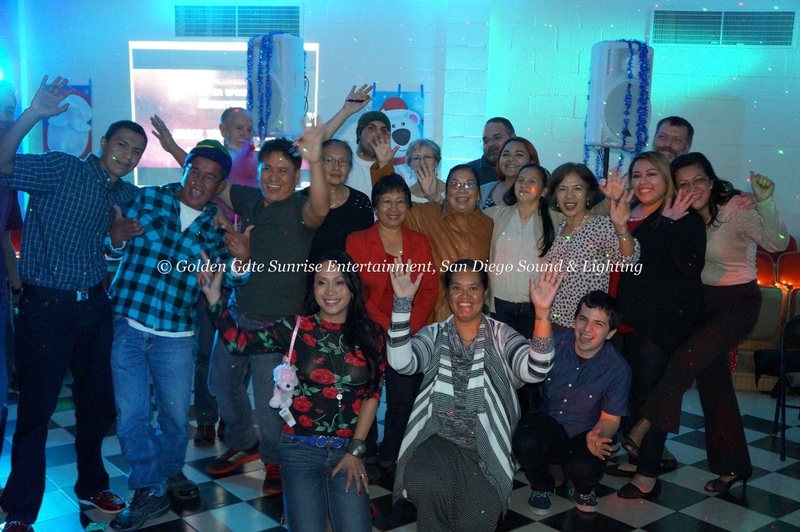 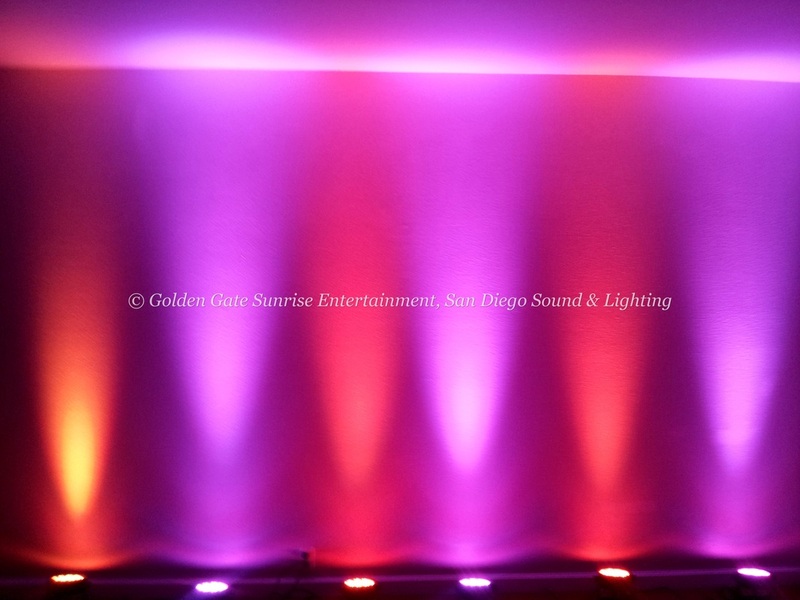 Lighting Type: Color Wash Lighting, Dance Floor Lighting (DJ Lights), LED Up Lighting, Gobo Lighting, Mini String Lighting and a Fog Machine. Fixtures Used: Chauvet Slim Par 38 LED, Chauvet Gobo Zoom LED 2.0, American DJ Jellyfish LED, ADJ Glaxian, DJ Laser Effects and Standard Mini String Lights (Warm White Color). 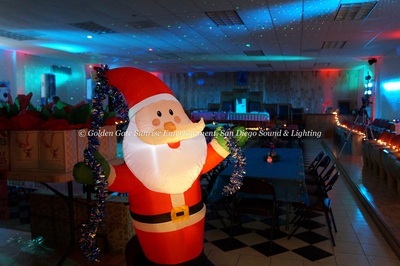 Number of Fixtures in the Room: 40. 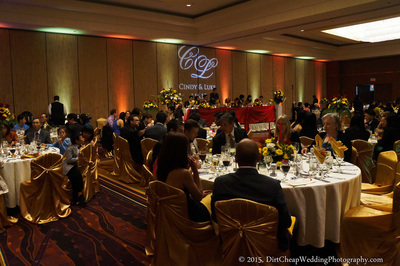 ﻿Event Type:﻿ Wedding Ceremony and Reception. 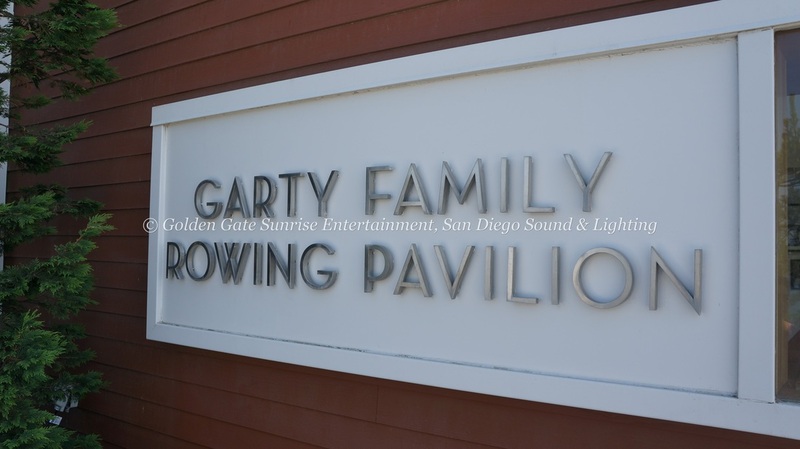 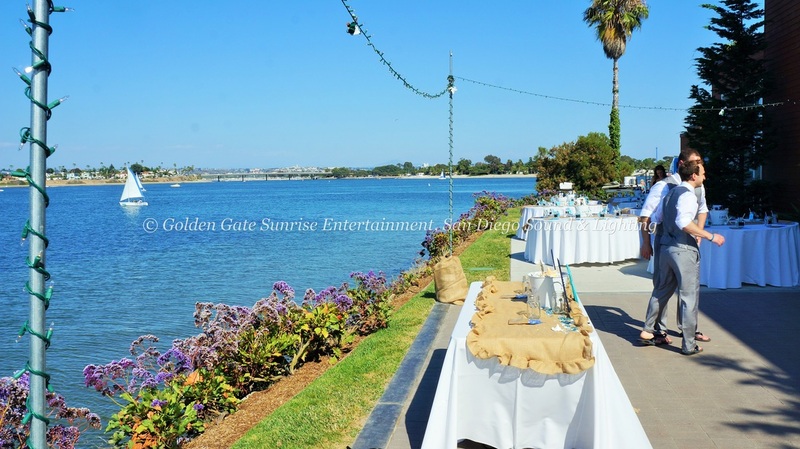 ﻿Event Location: San Diego Rowing Club, Garty Pavilion, San Diego, CA. 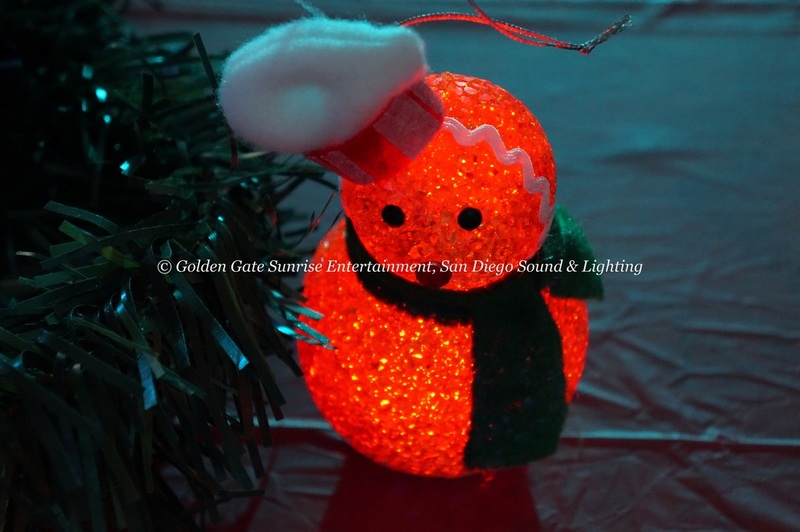 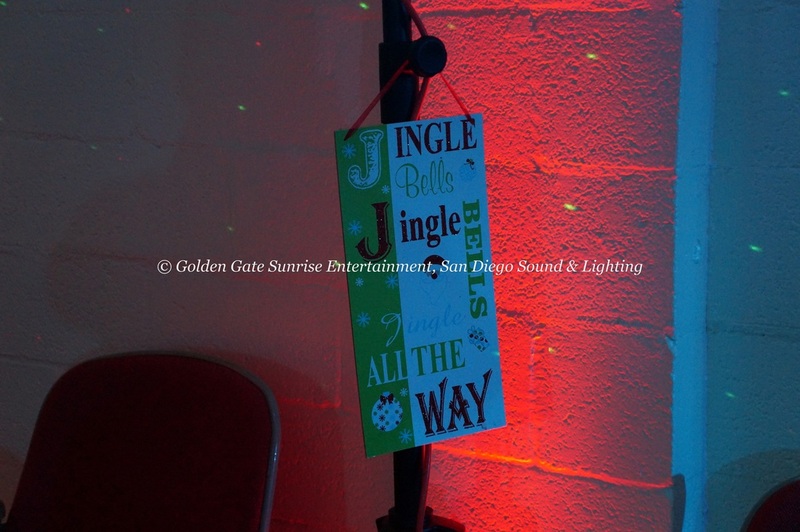 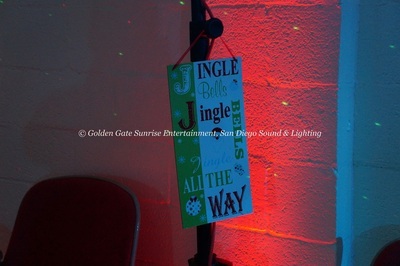 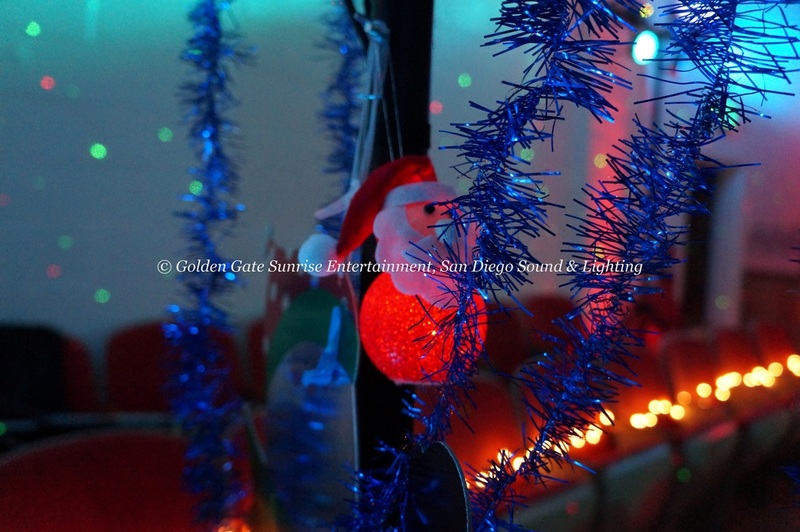 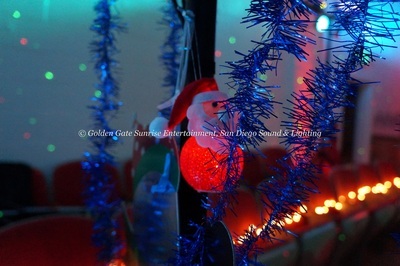 ﻿﻿Lighting Type: ﻿﻿Mini String Lighting and Dance Floor Lighting (DJ Lights). Fixtures Used: Chauvet Slim Par 38 LED, American DJ Jellyfish LED, DJ Laser Effects and Standard Mini String Lights (Warm White Color). ﻿Number of Fixtures in the Room: ﻿20 (6 LED lights and 14 strings of mini globe lights). 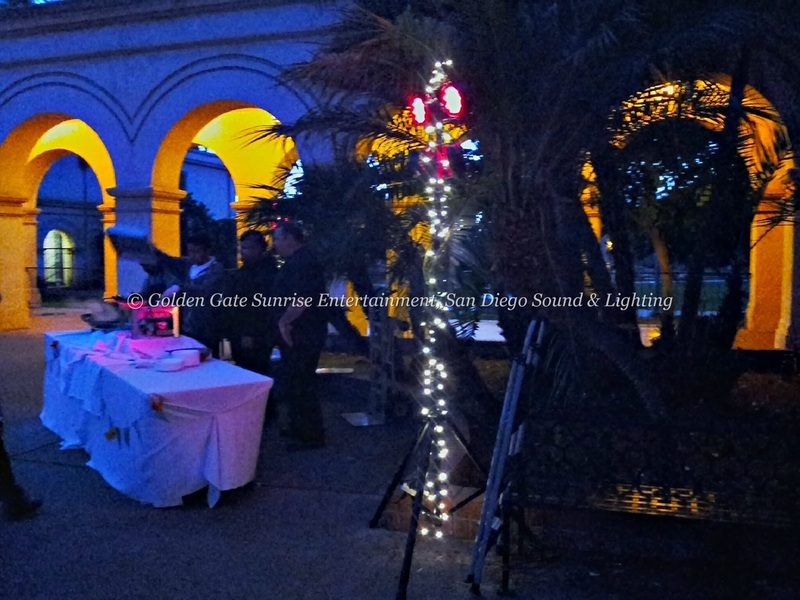 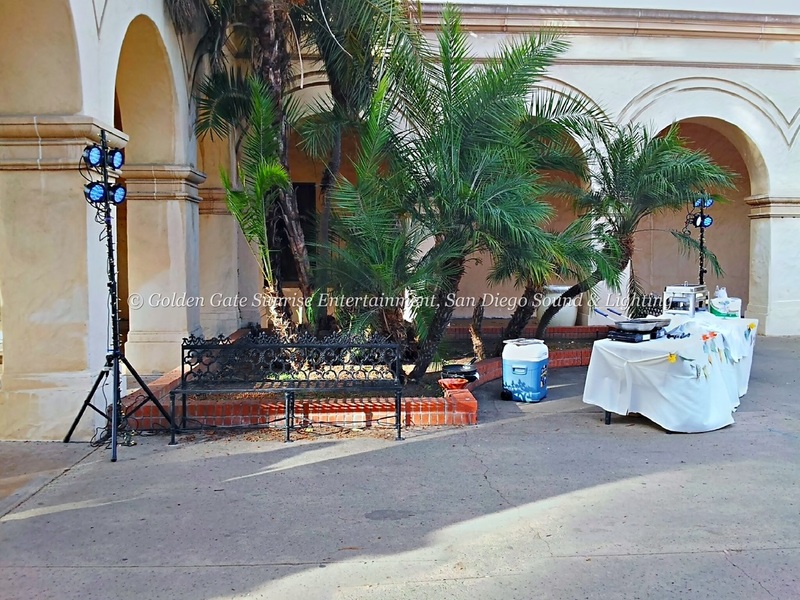 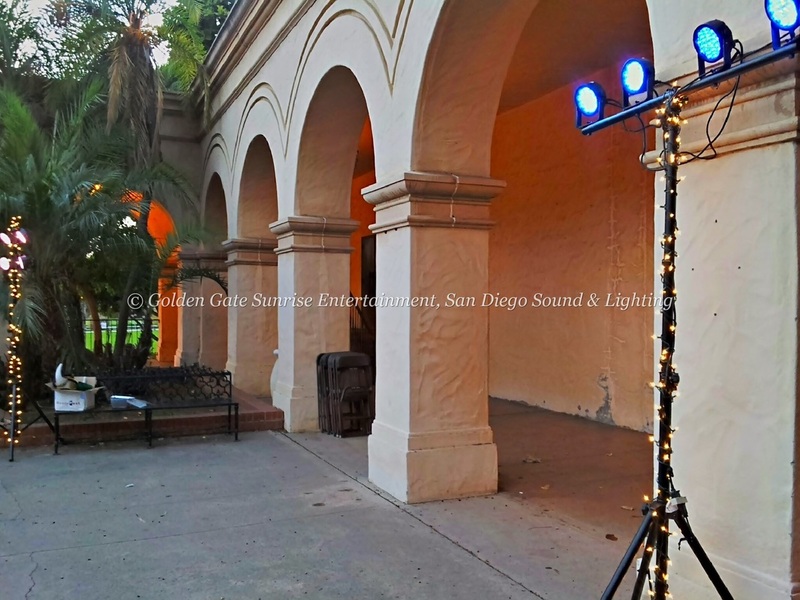 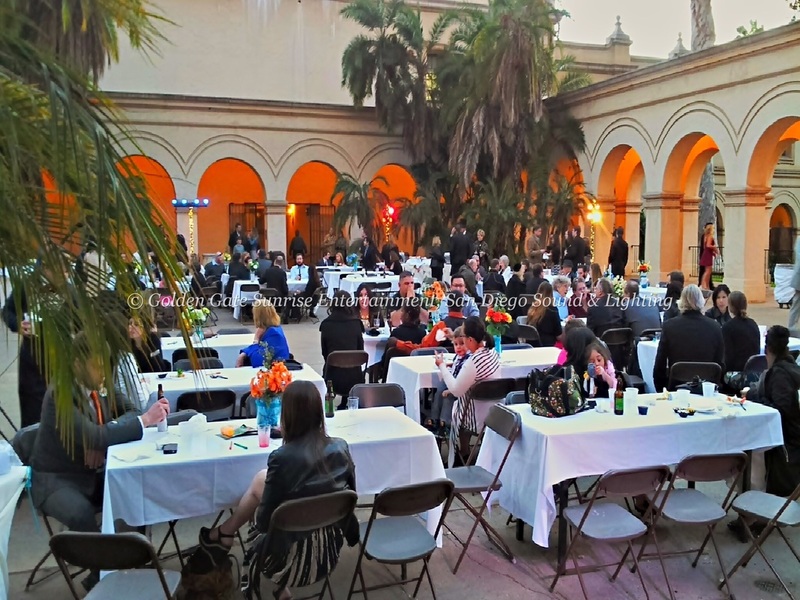 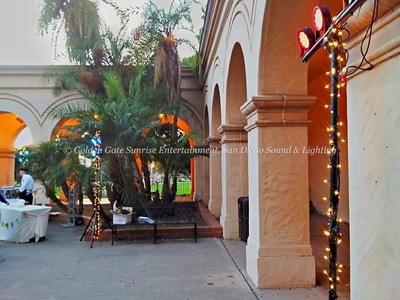 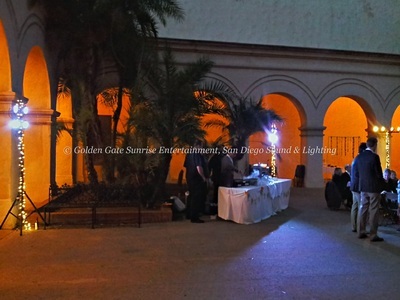 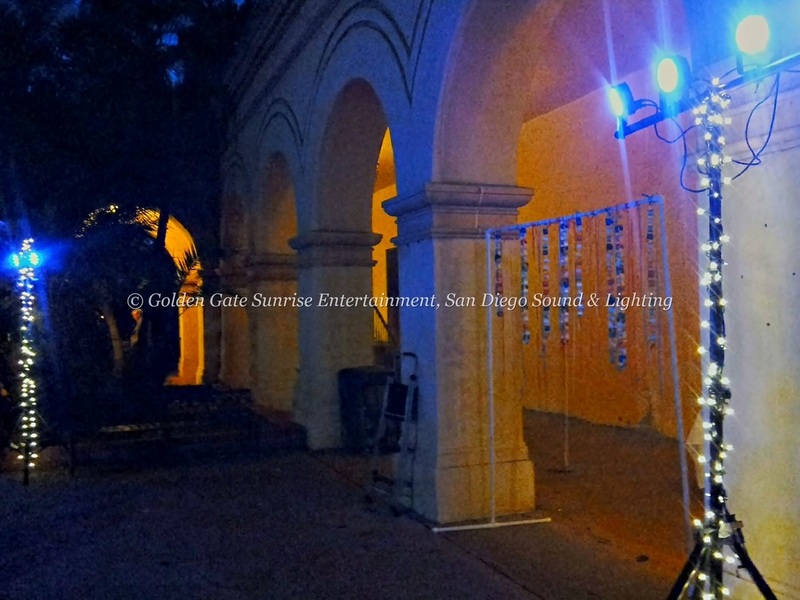 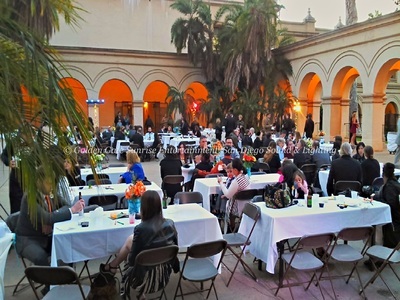 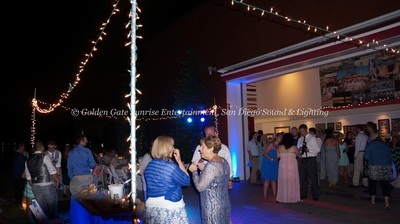 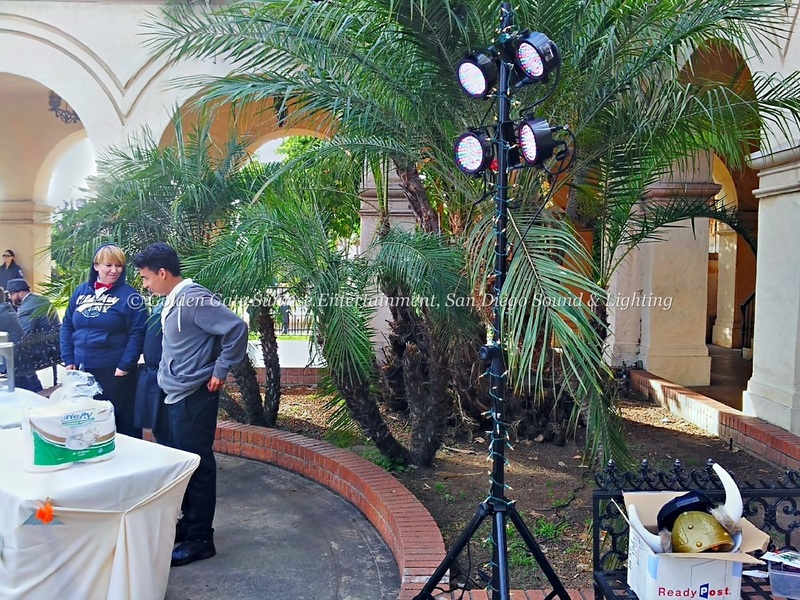 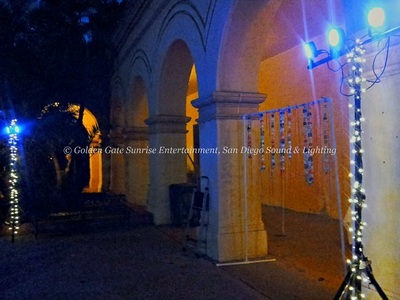 ﻿Event Location: Casa Del Prado Patio B (in Balboa Park), San Diego, CA. 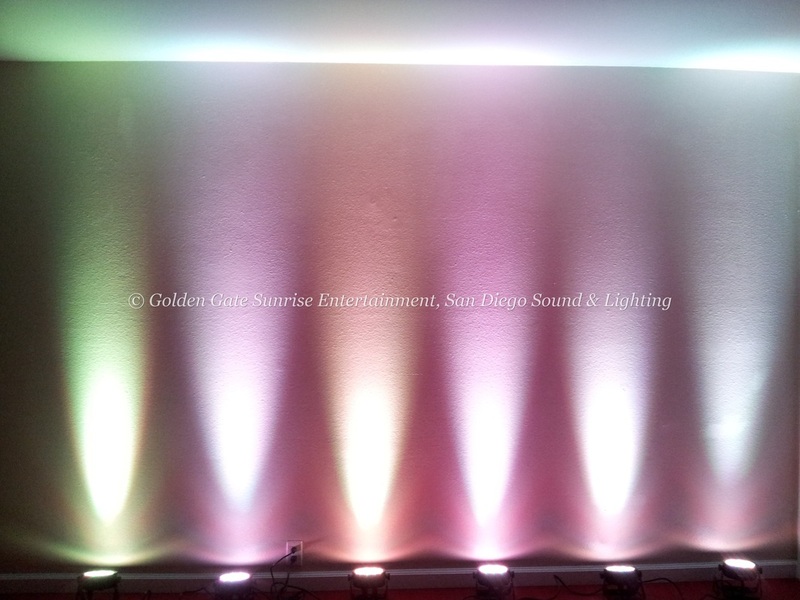 Lighting Type: Lighting Trees, Color Wash/Flood Lighting. 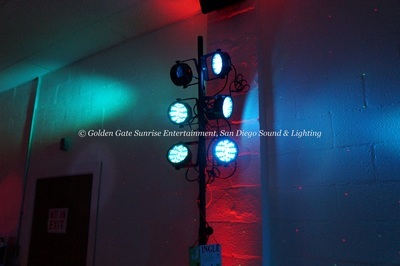 Fixtures Used: Chauvet Slim Par 38 and Tripod Stands. 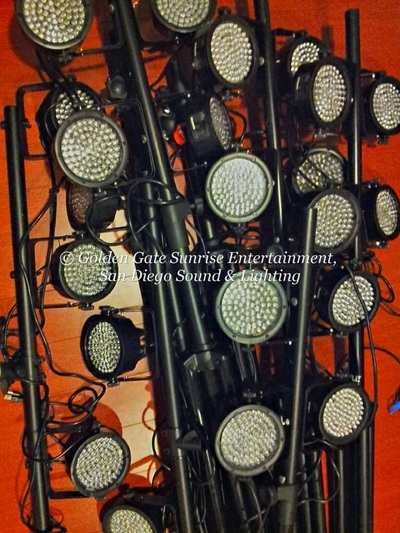 Number of Fixtures in the Room: 24 (6 stands with 4 lights mounted on each stand). 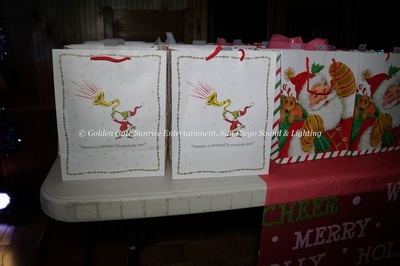 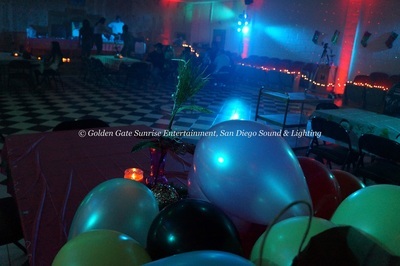 Event Type: Sweet 16 Celebration. 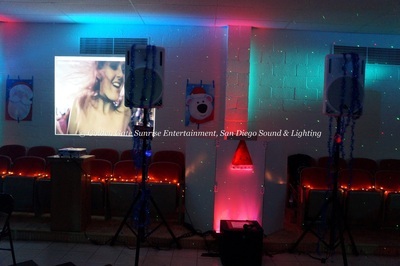 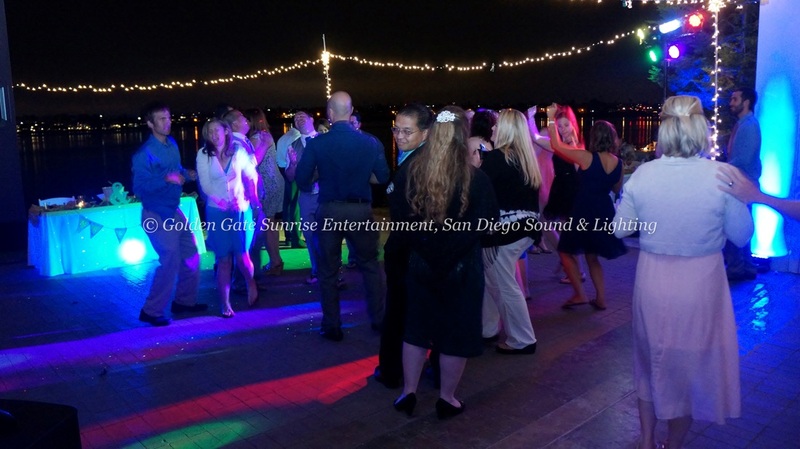 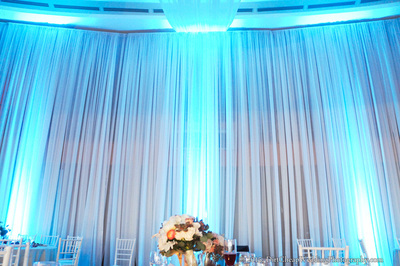 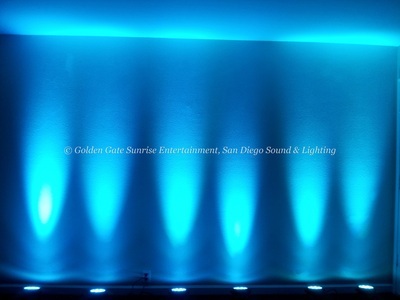 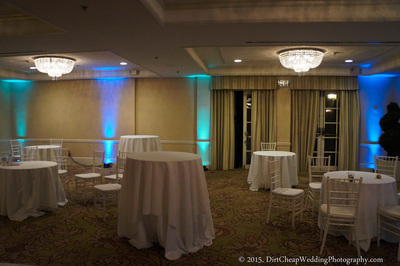 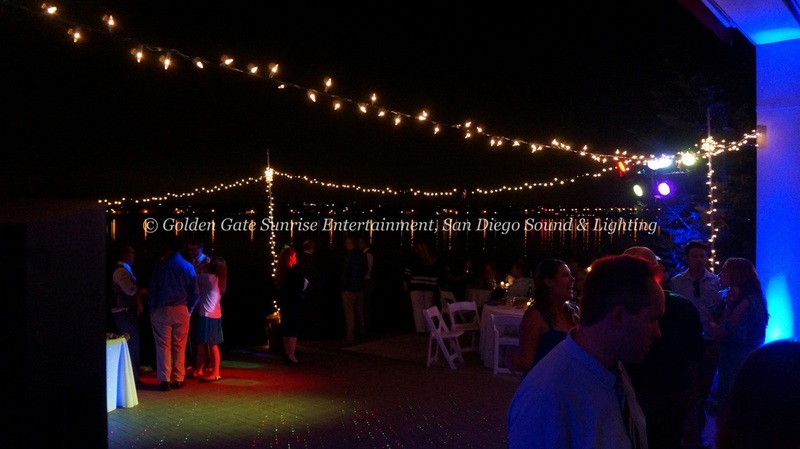 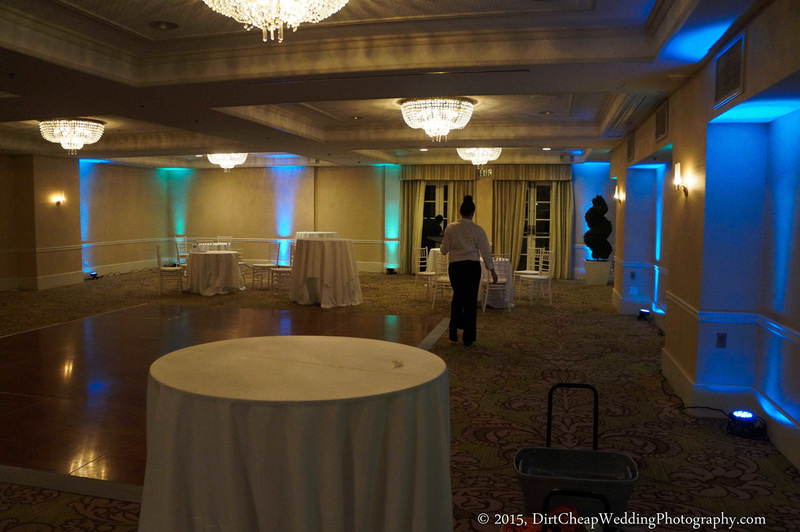 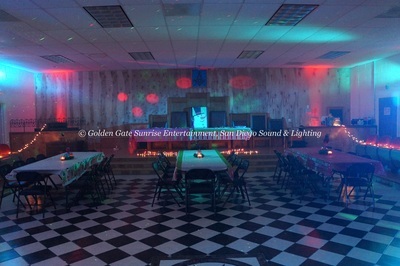 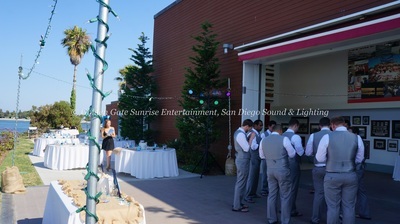 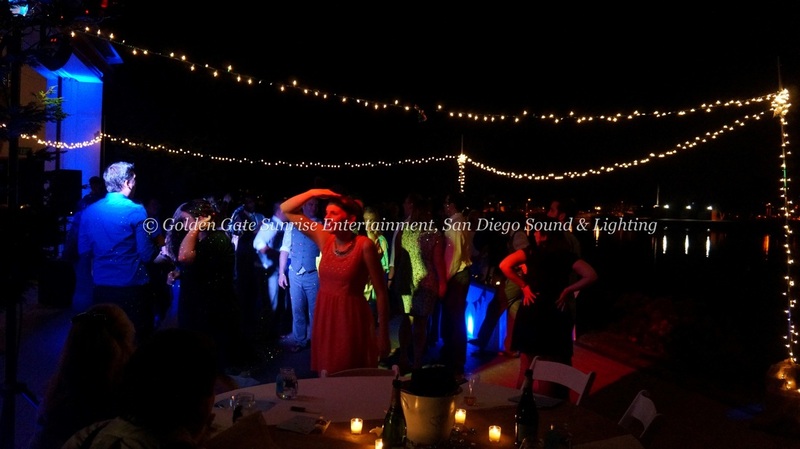 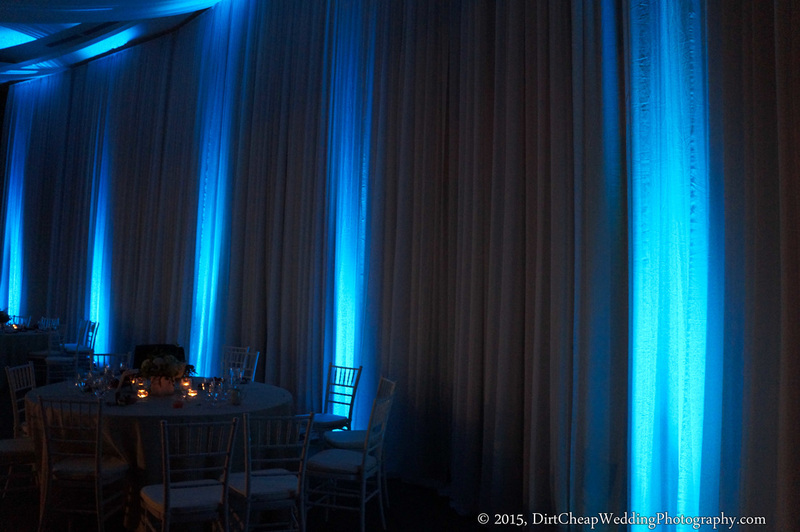 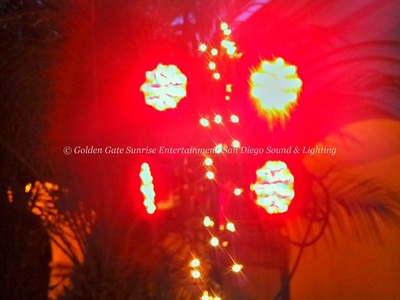 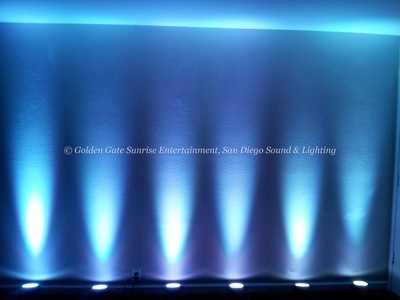 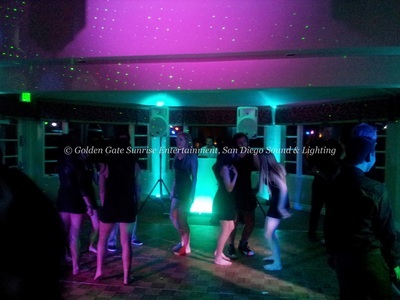 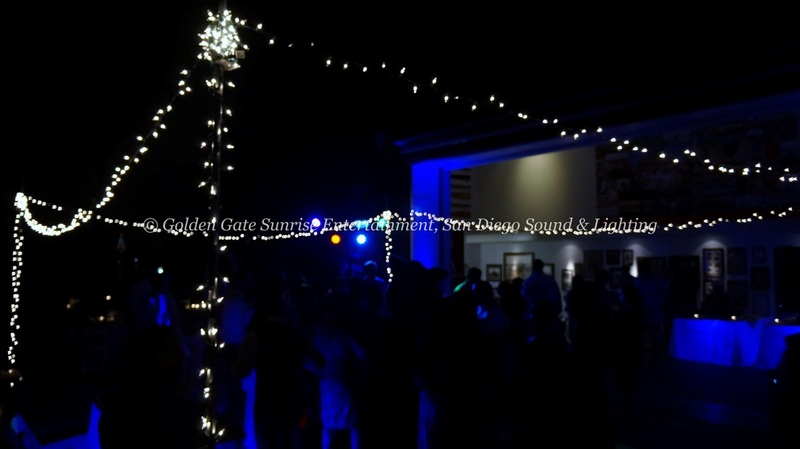 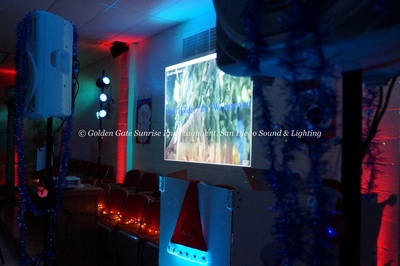 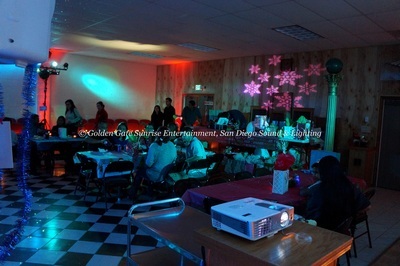 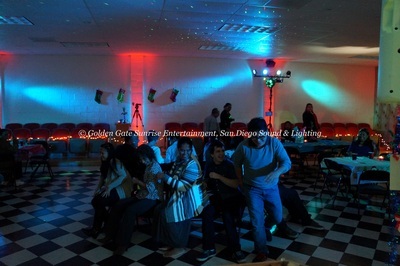 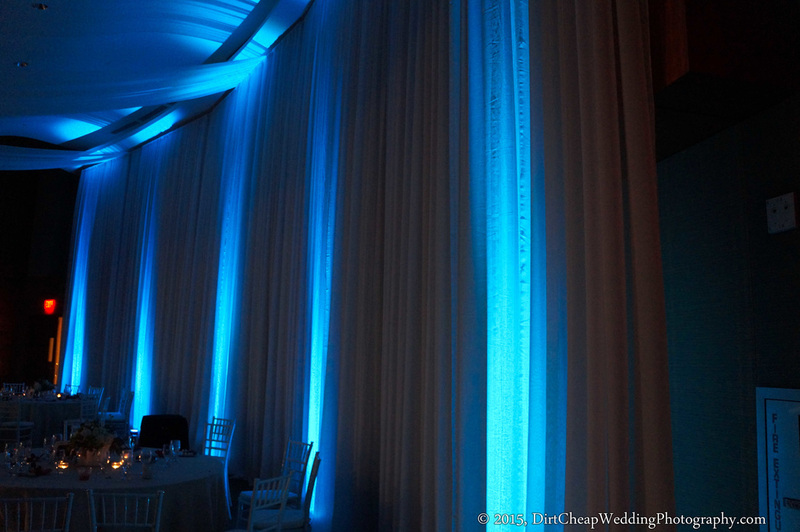 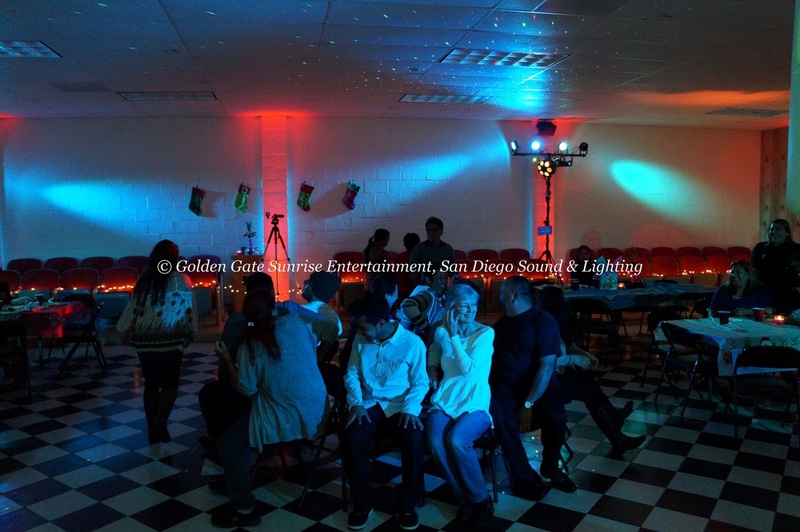 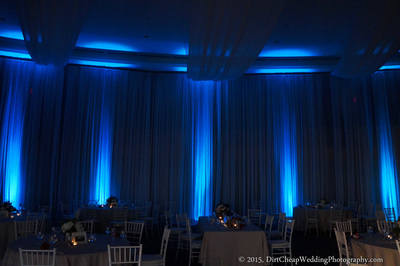 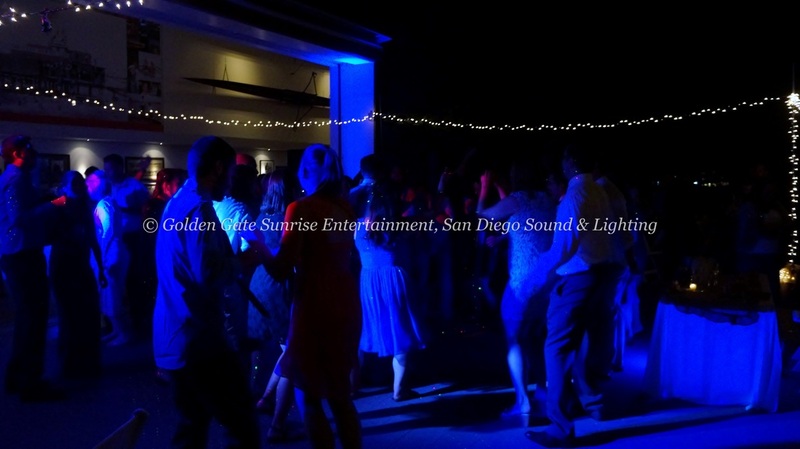 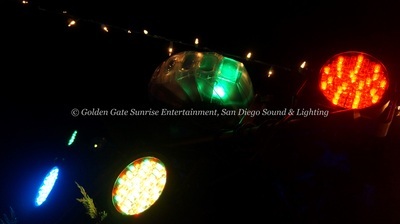 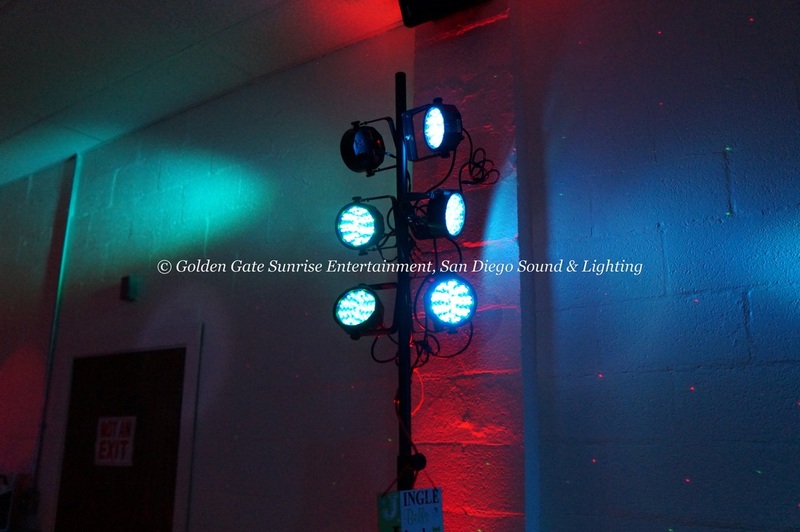 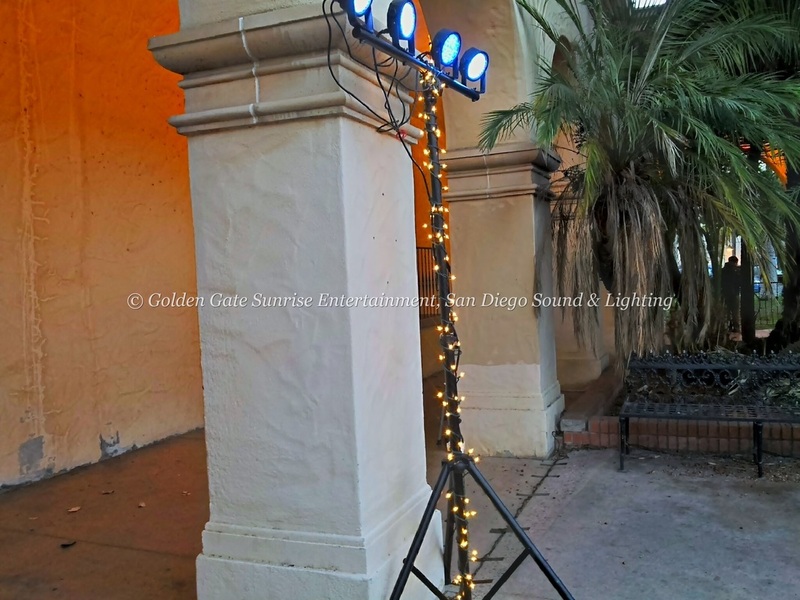 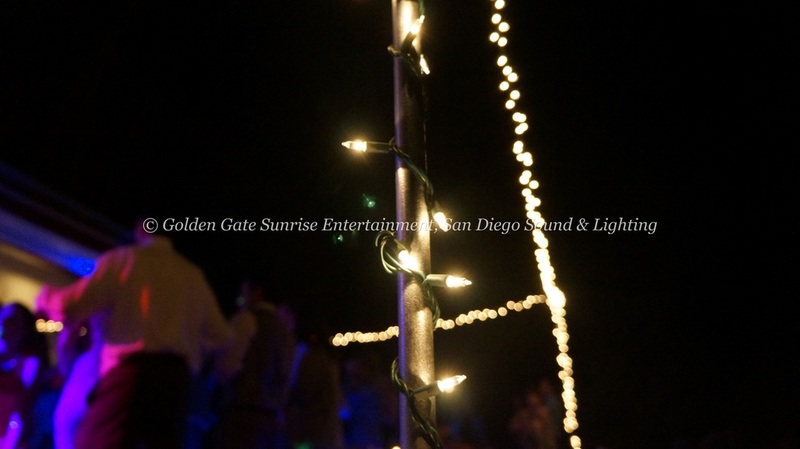 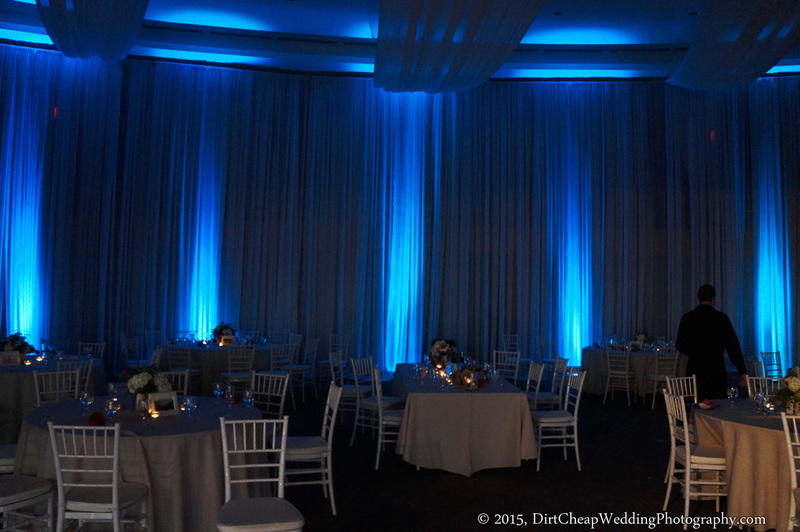 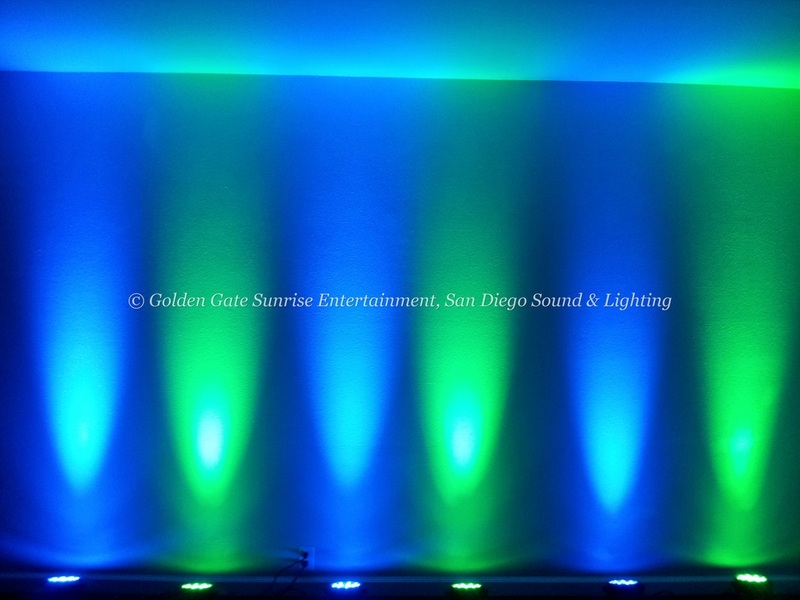 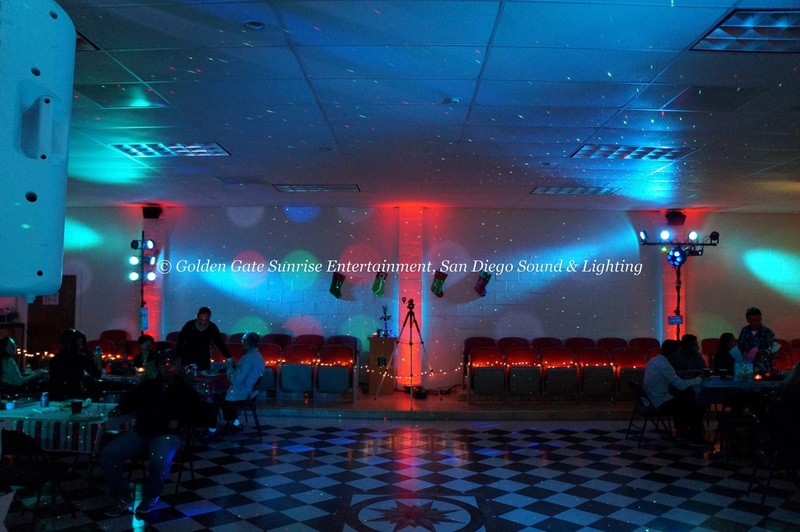 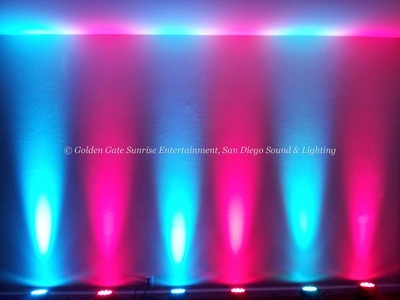 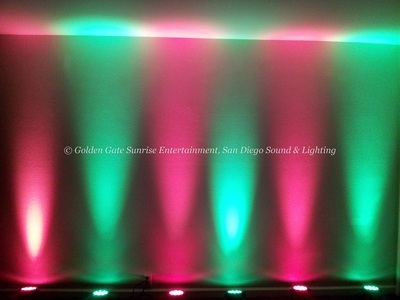 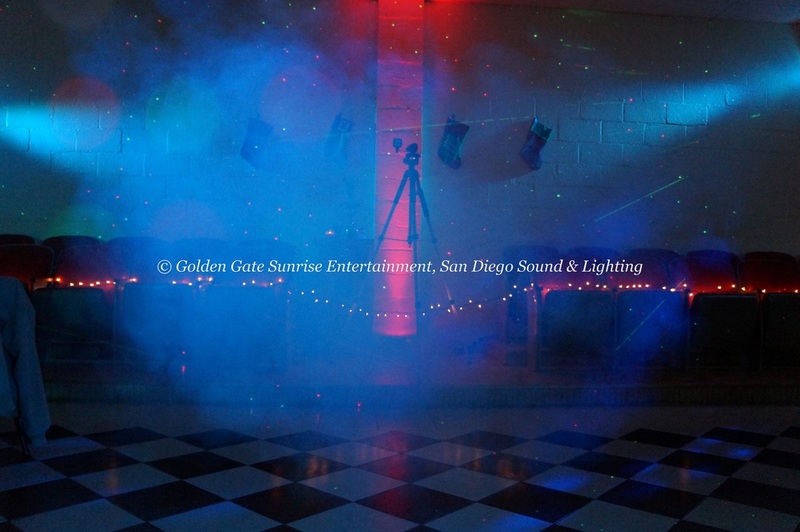 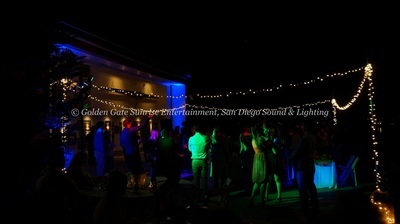 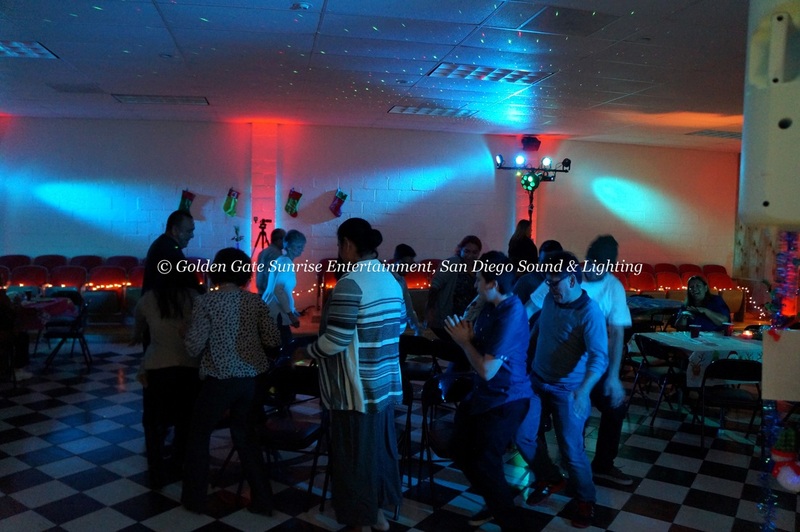 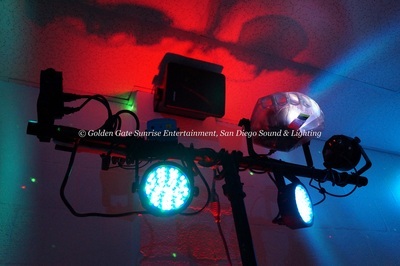 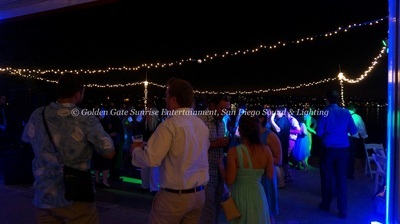 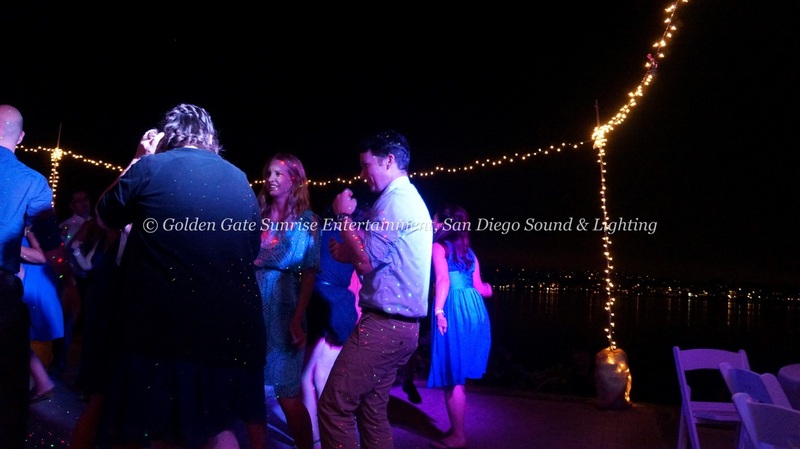 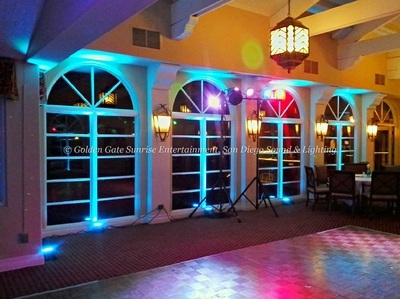 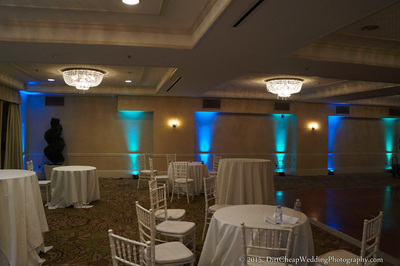 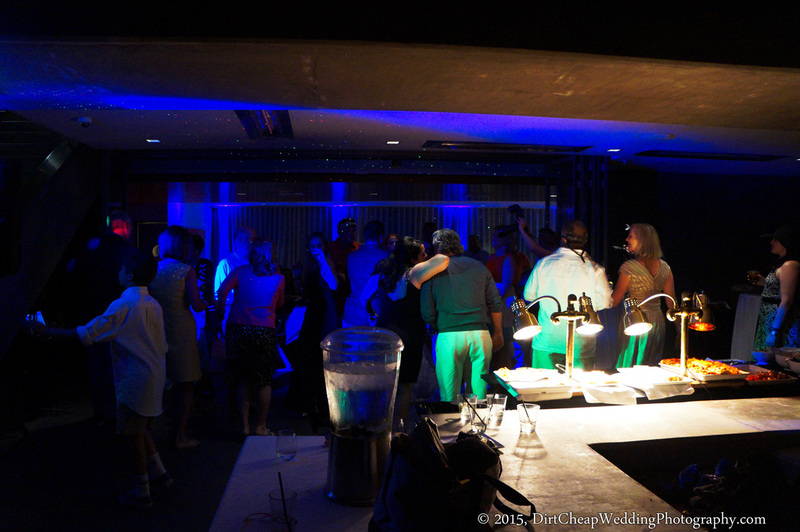 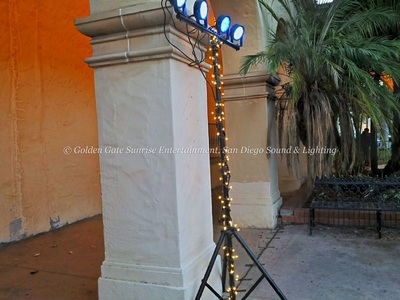 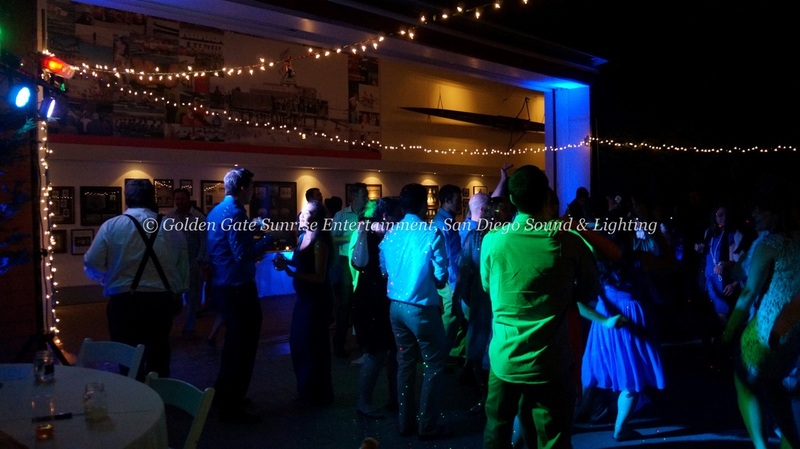 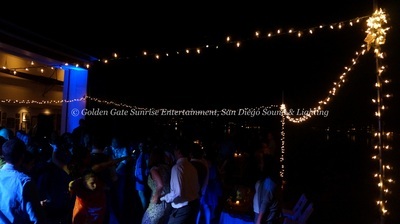 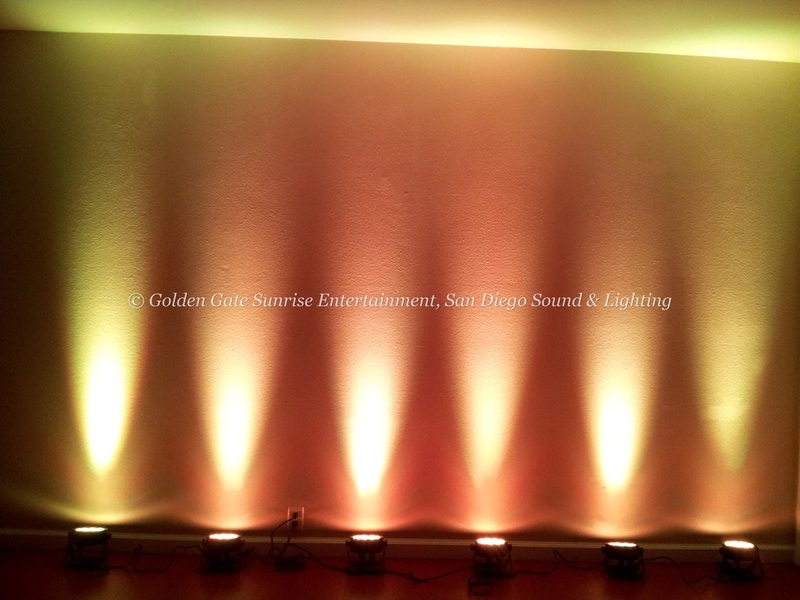 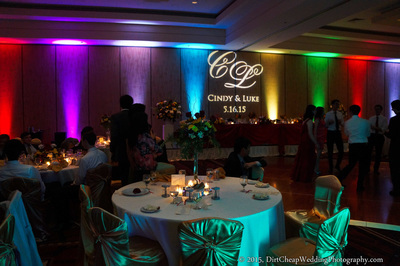 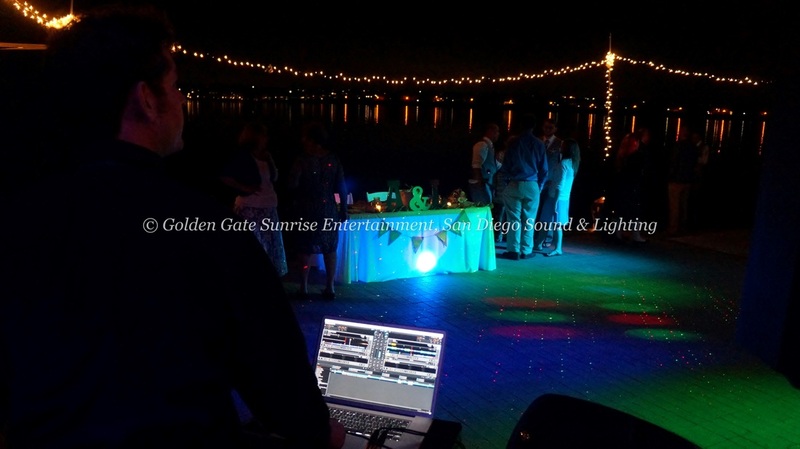 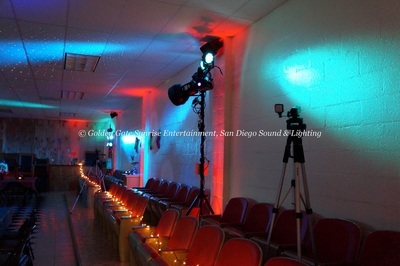 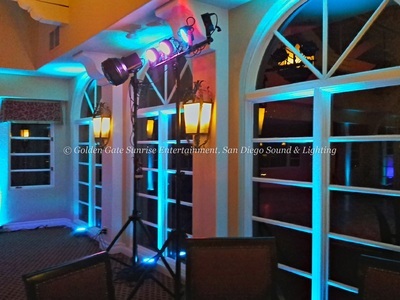 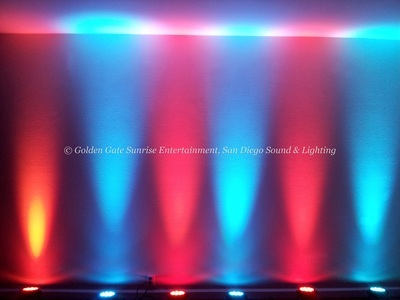 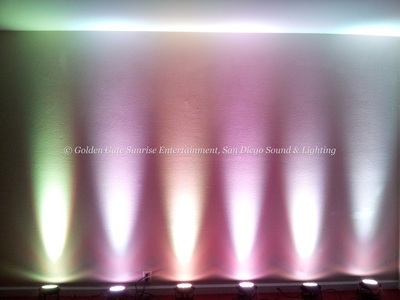 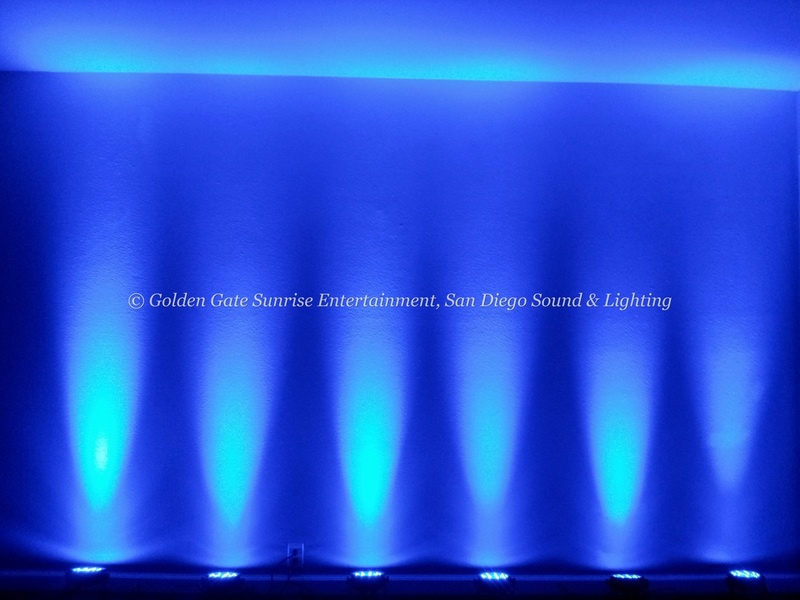 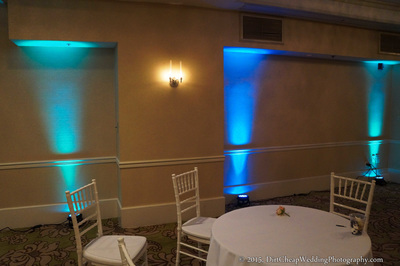 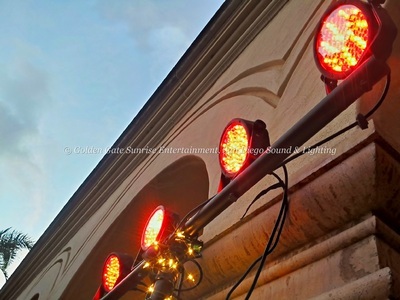 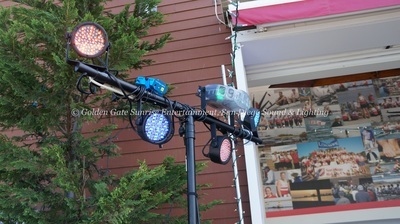 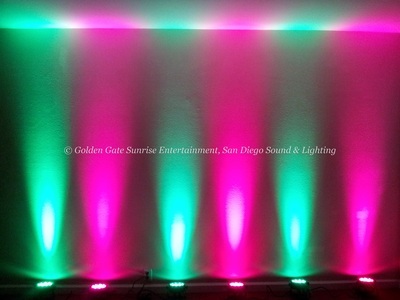 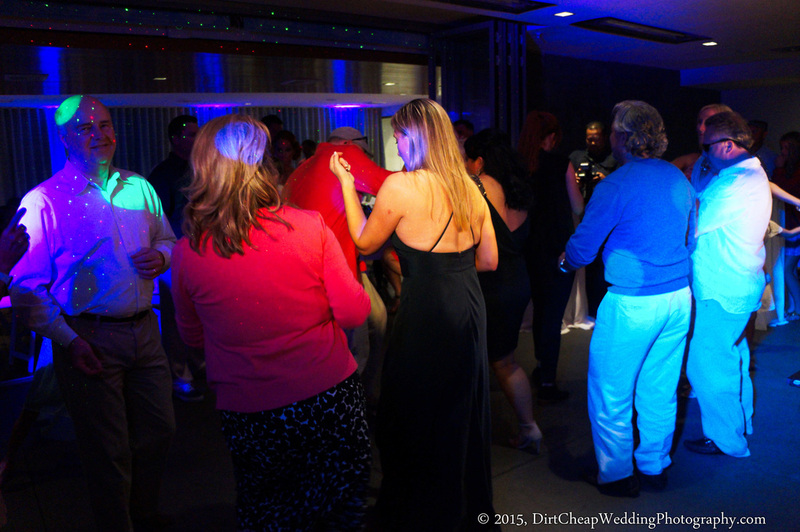 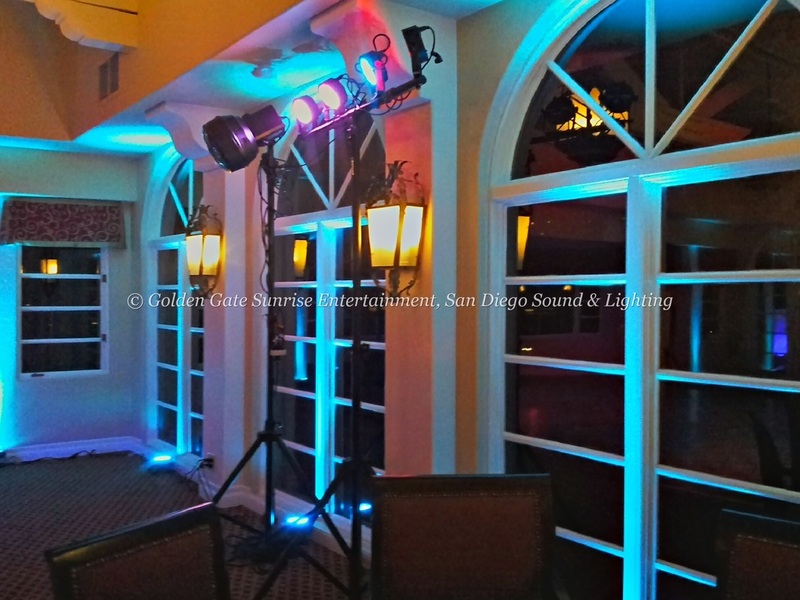 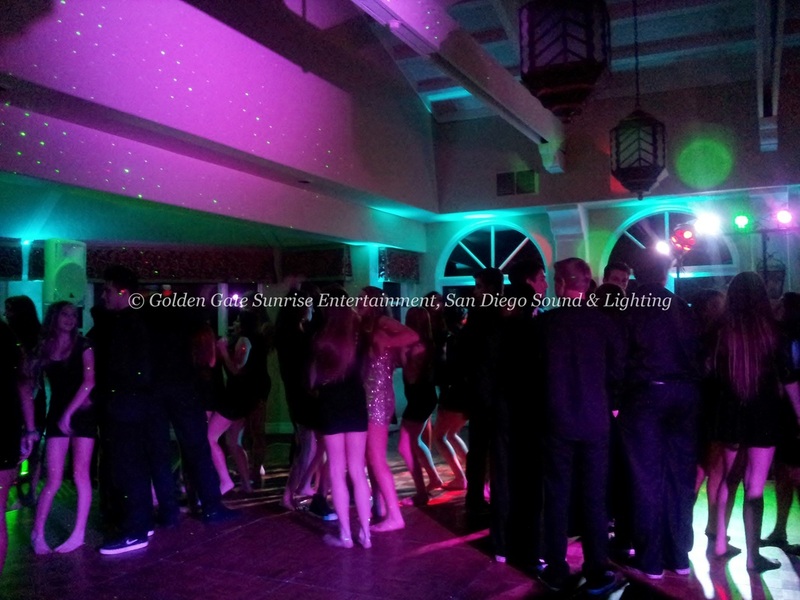 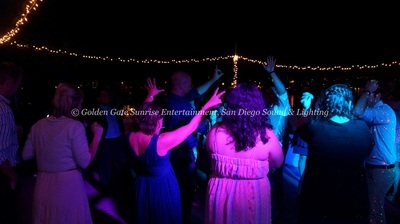 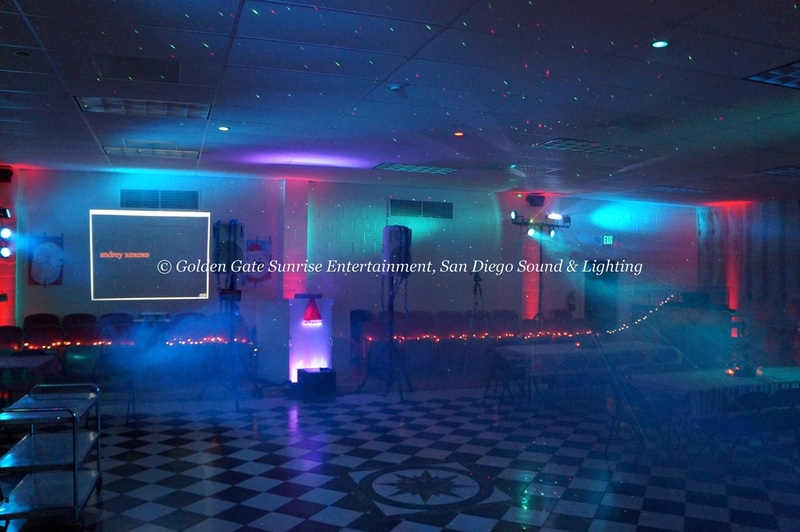 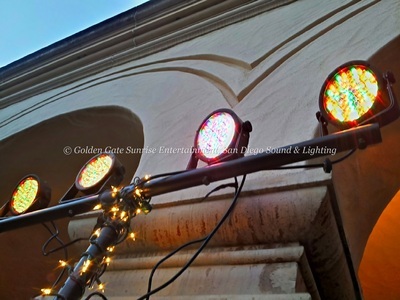 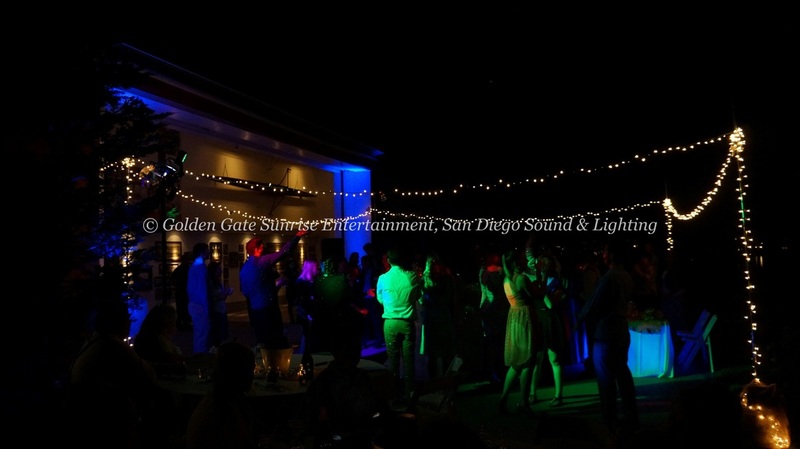 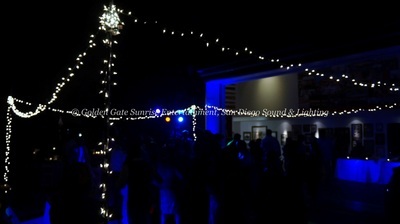 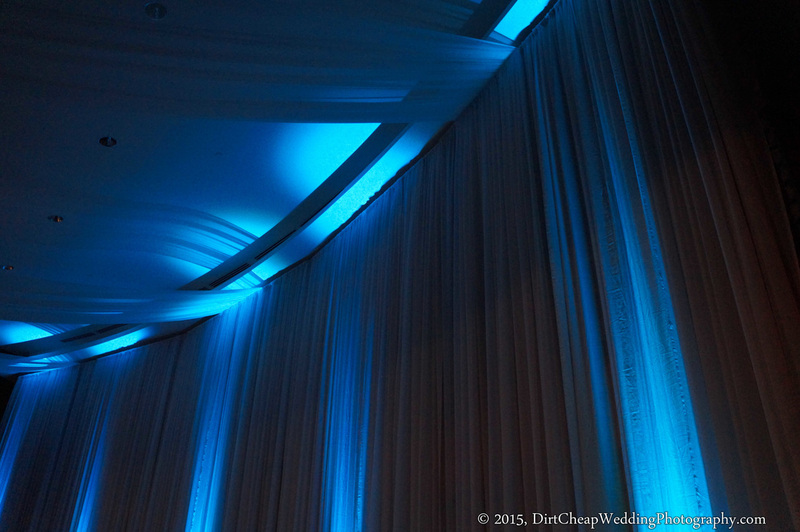 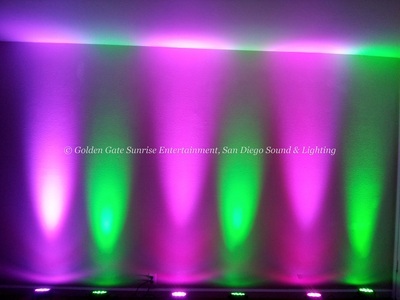 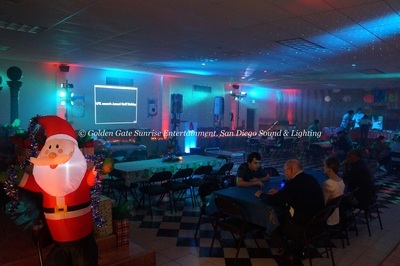 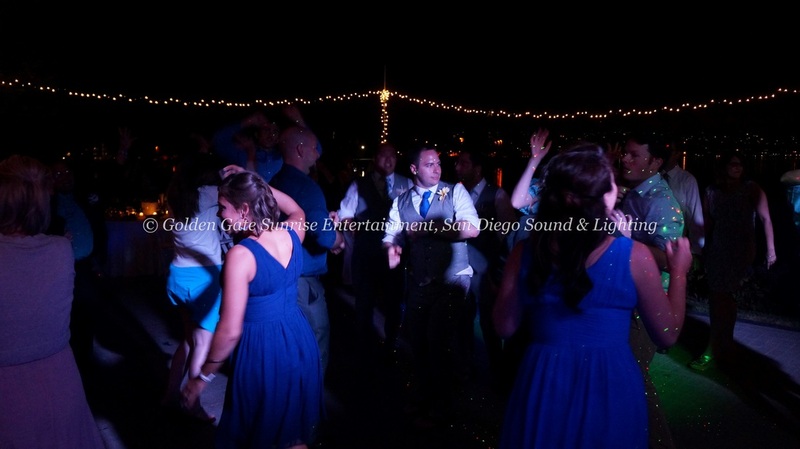 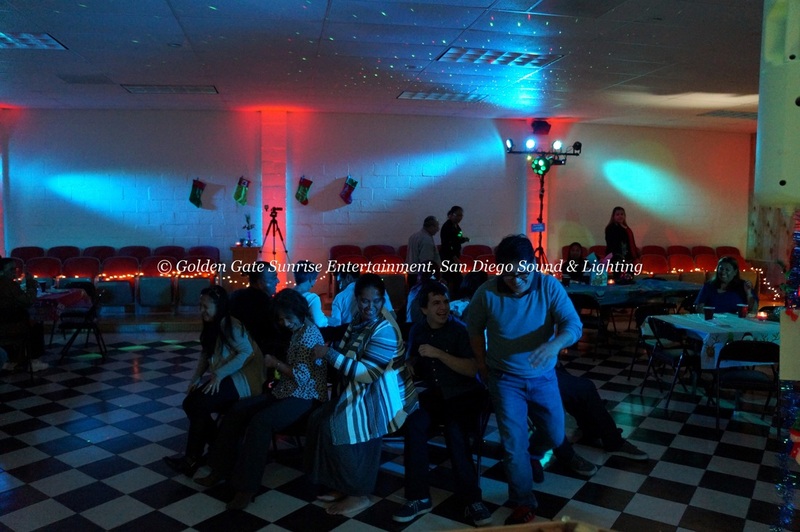 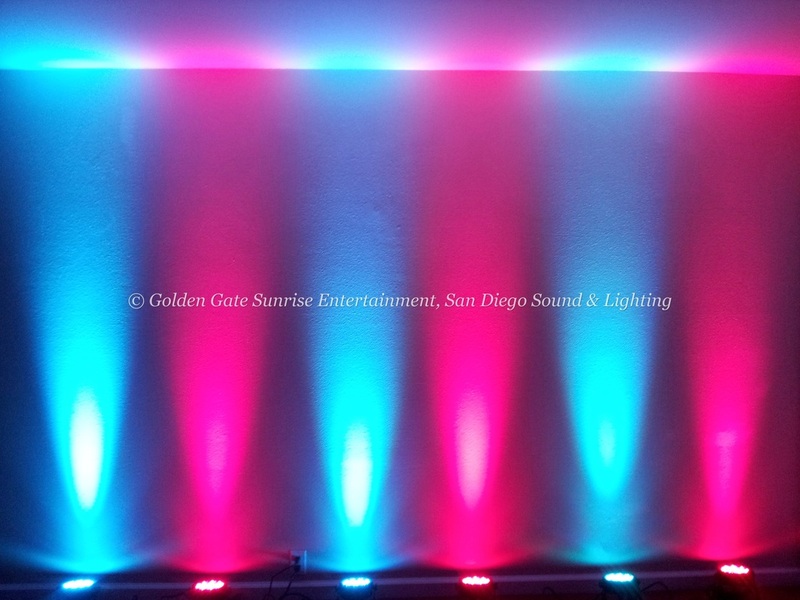 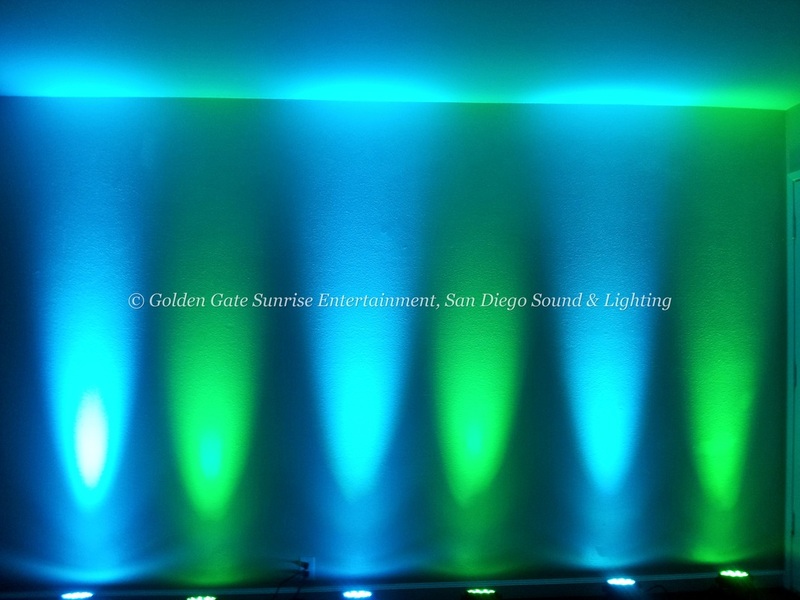 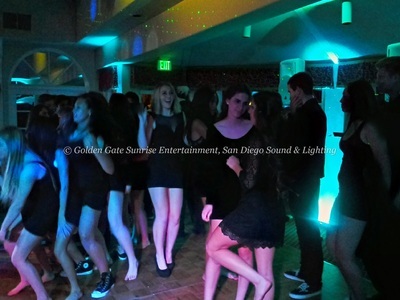 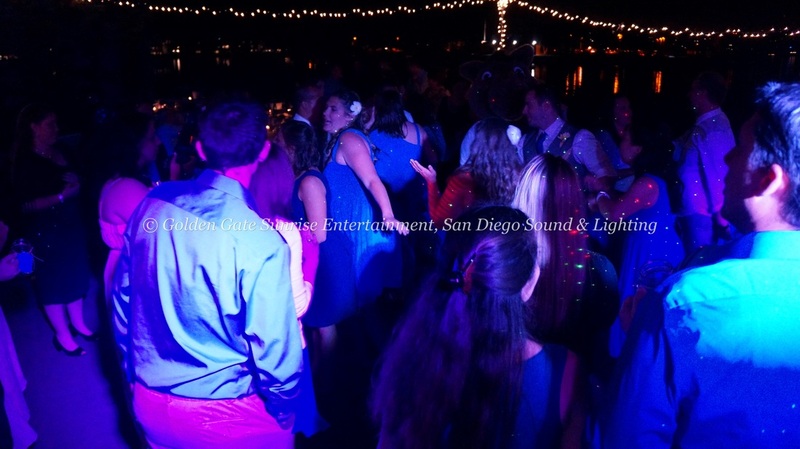 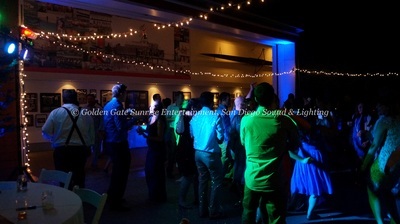 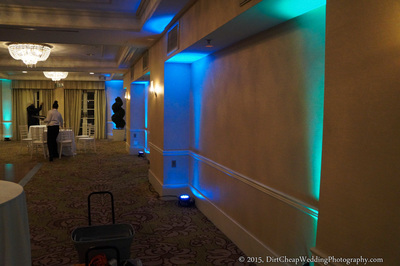 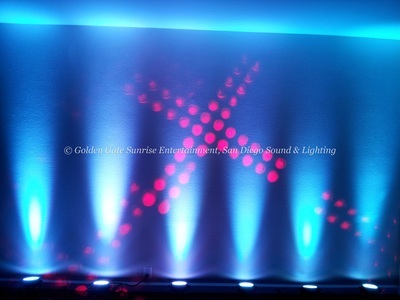 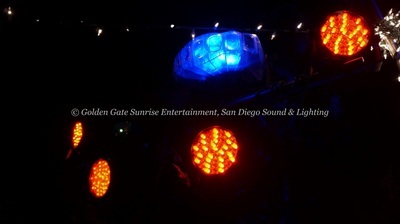 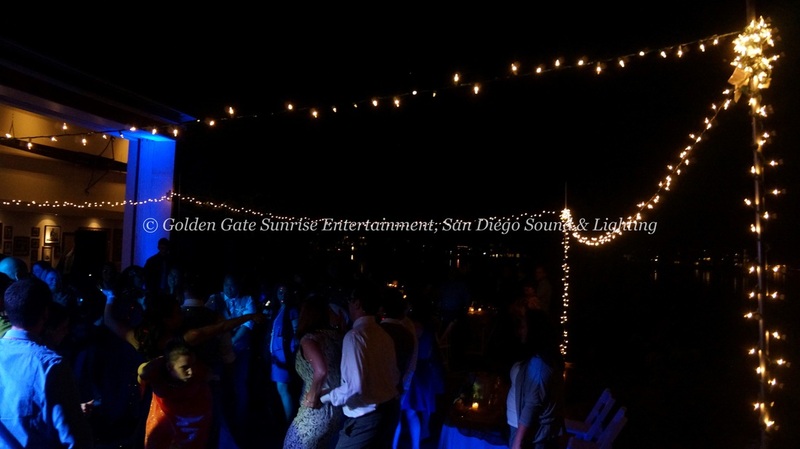 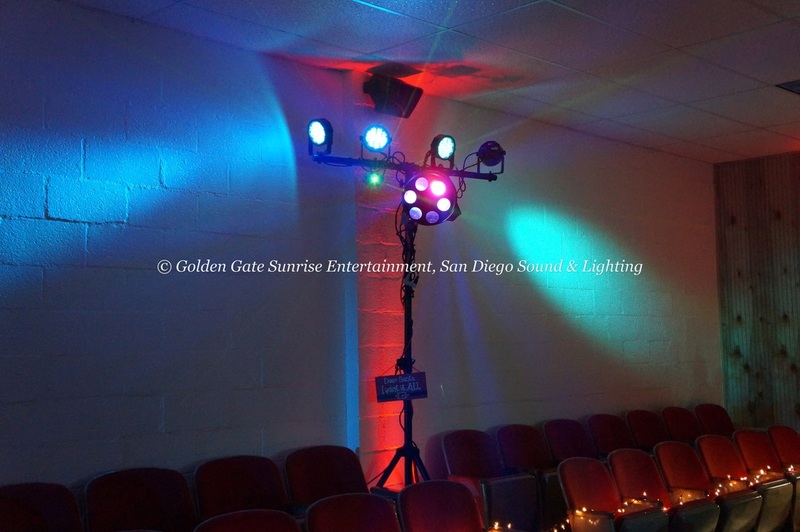 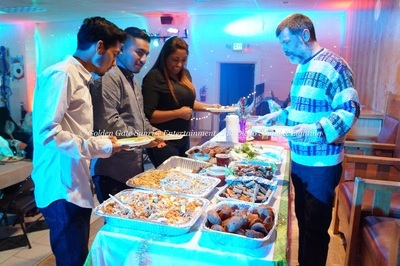 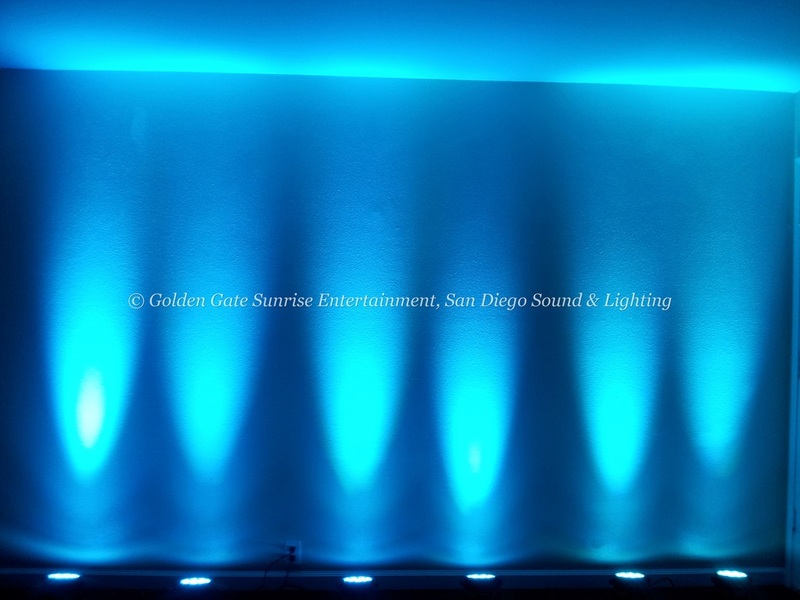 Lighting Type: Tiffany Blue Up Lights, Color Wash/Flood Lighting, Dance Floor Lighting. 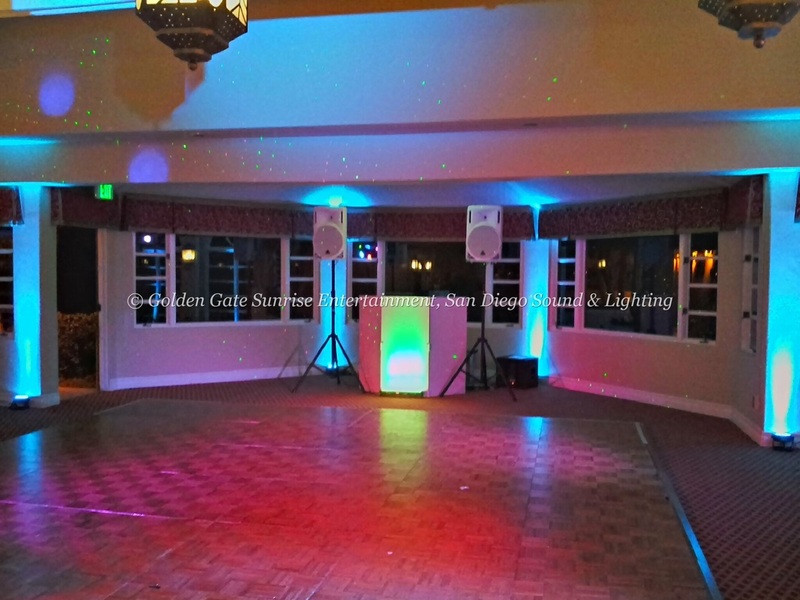 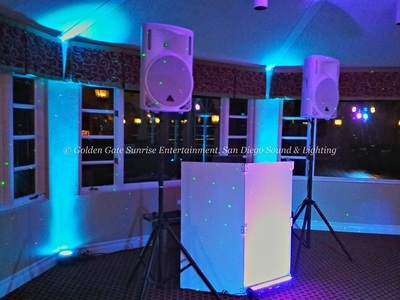 Fixtures Used: Chauvet Slim Par 38, American DJ Jellyfish, American DJ Mystic LED, American DJ Megabar 50, DJ Laser Effects and Eliminator Lighting Electro 86. 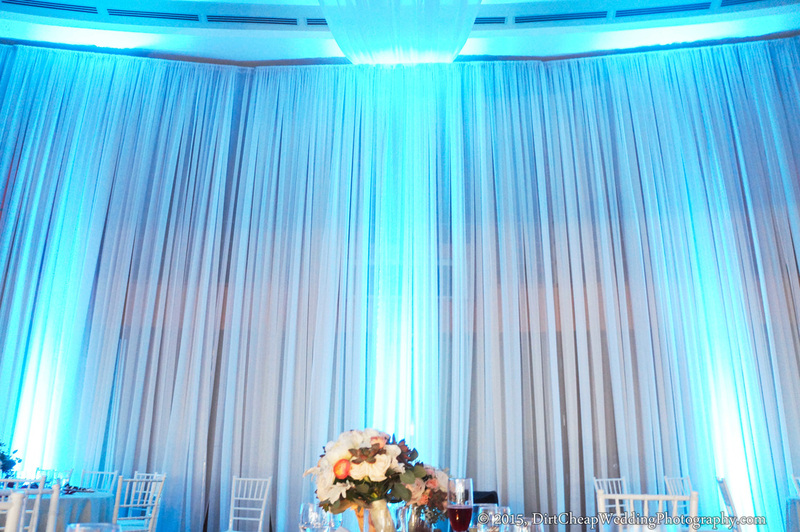 ﻿Number of Fixtures in the Room:﻿ 24. 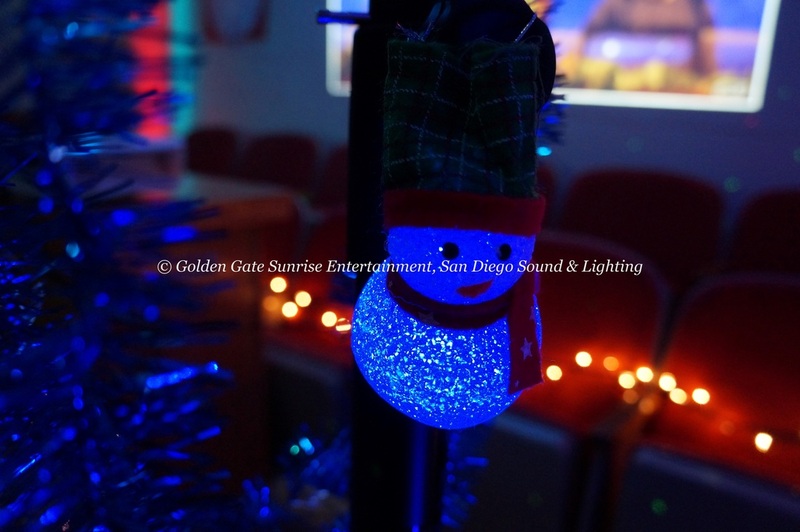 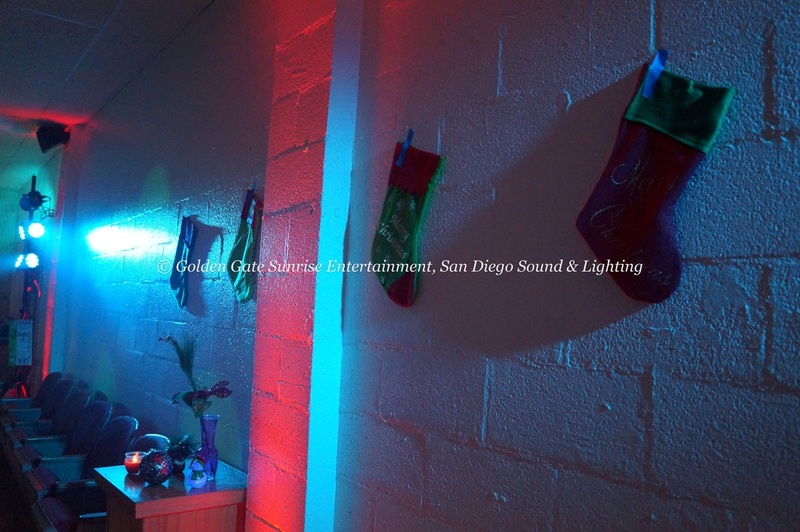 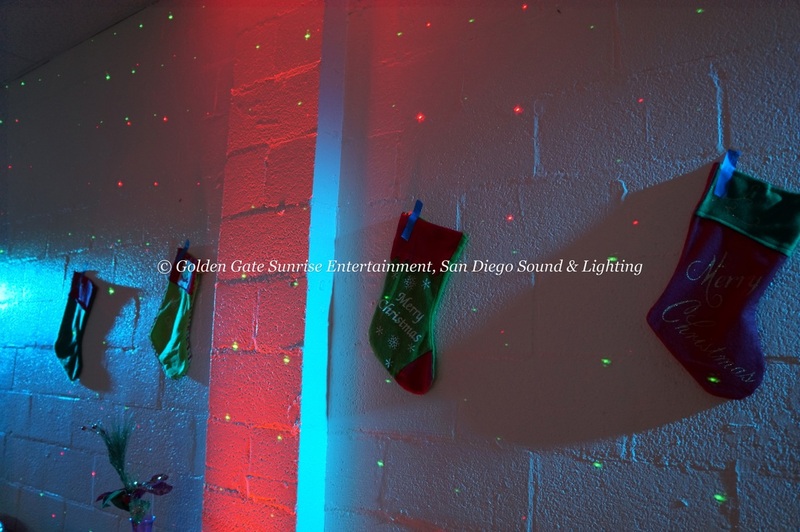 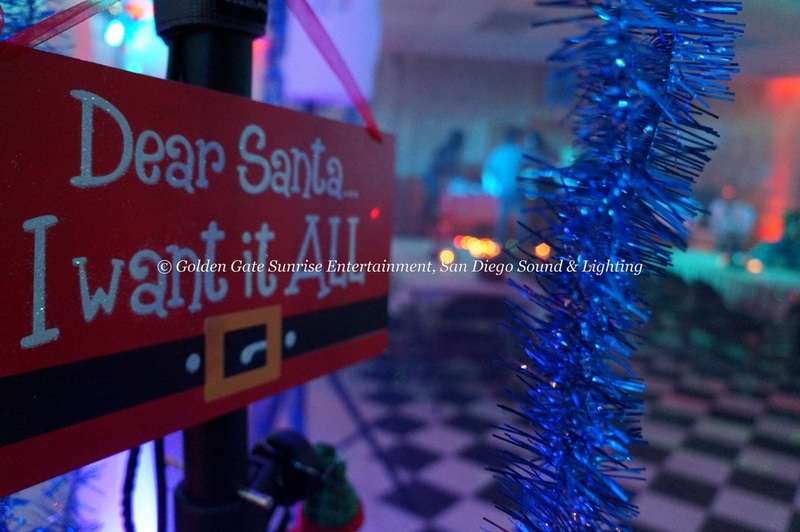 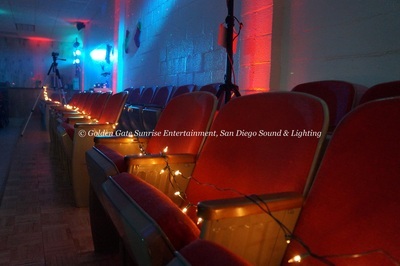 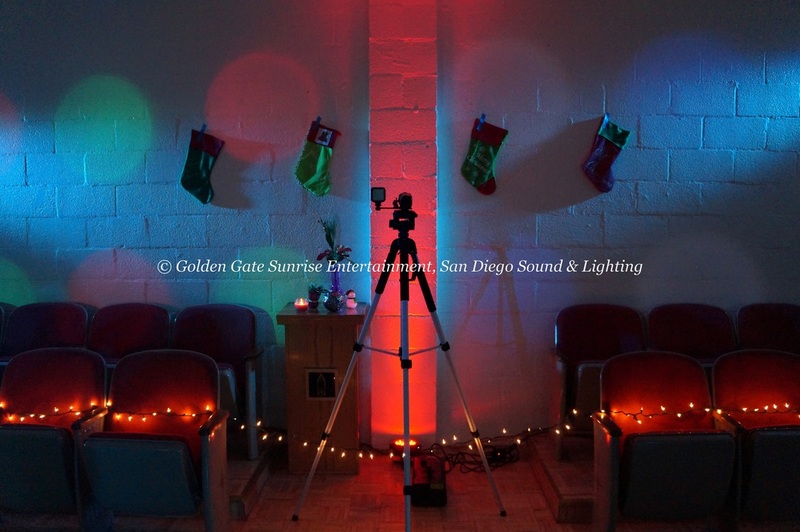 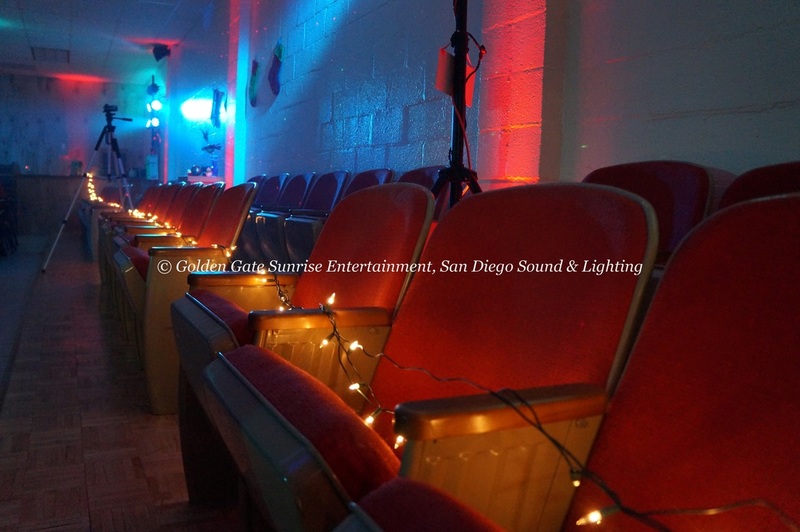 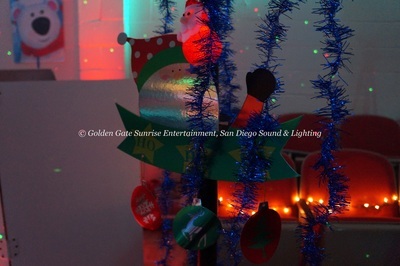 Event Location: Our studio/office in San Diego, CA. 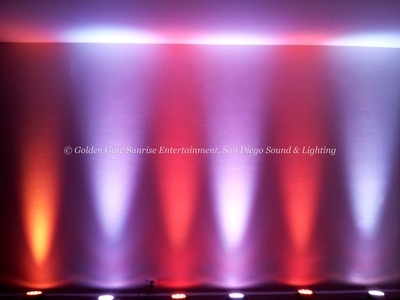 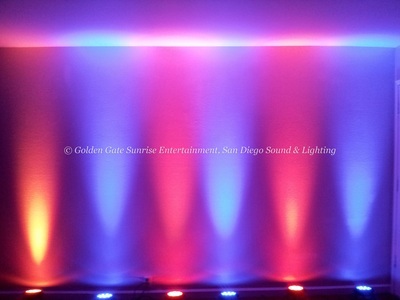 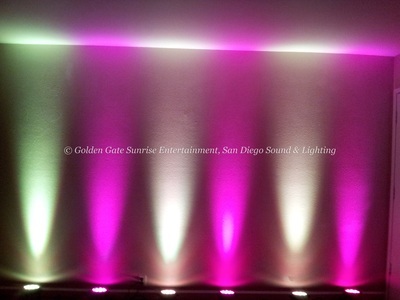 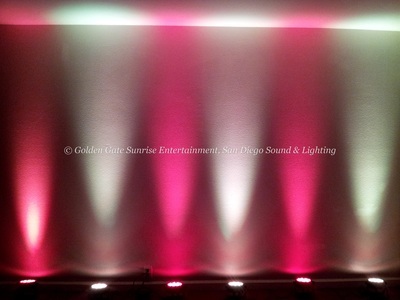 Lighting Type: LED up lighting in different colors and color combinations. 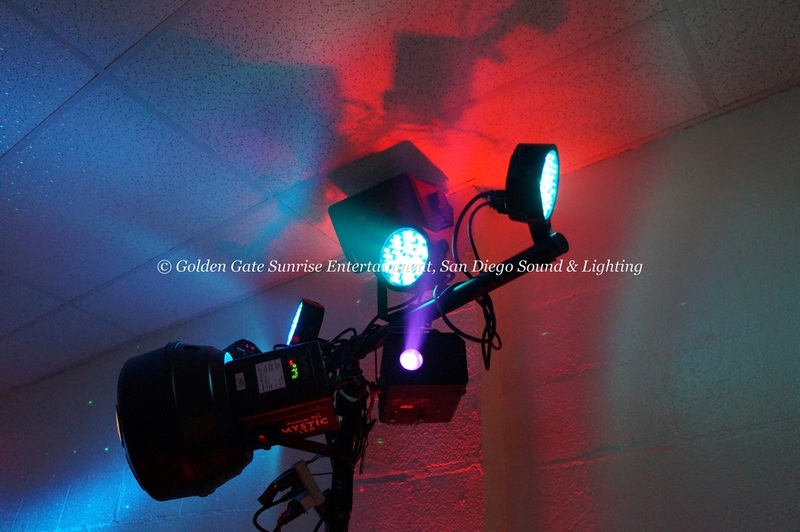 Fixtures Used: Chauvet Slim Par 38. Number of Fixtures in the Room: 6.